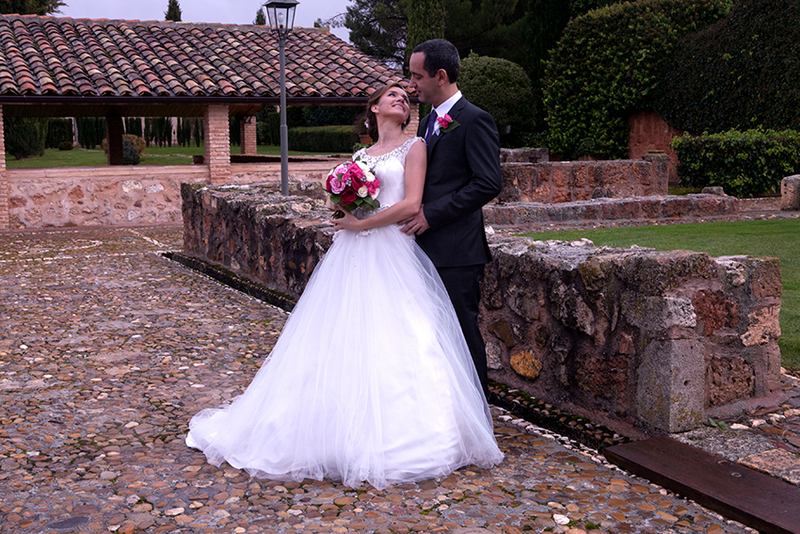 How make a wedding in Spain? 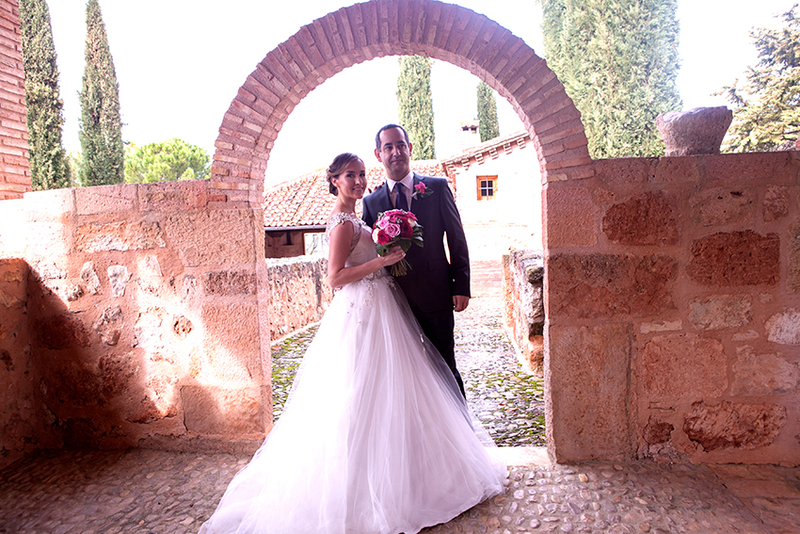 Is Spain we can make official and symbolic wedding. 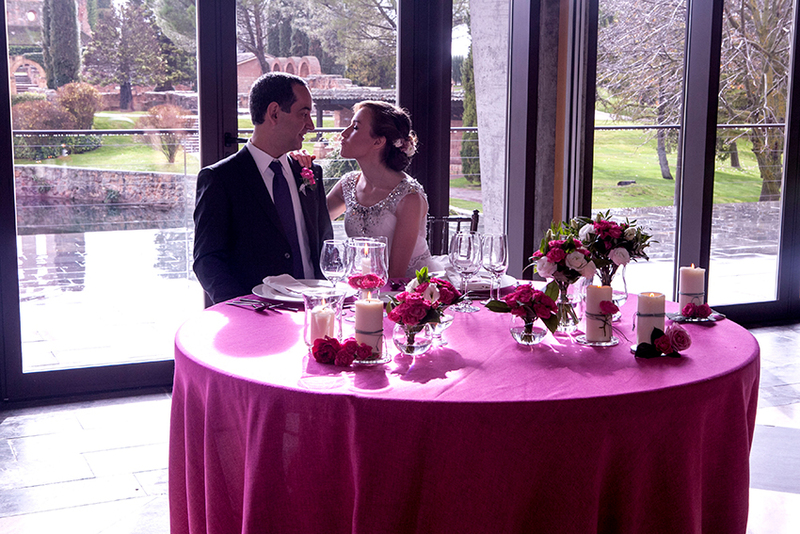 For official wedding you need have the one condition: one in a couple is resident of Spain. The symbolic wedding is available for many people. Such wedding don’t differ from official, only it hasn’t validity. But it has many preferences. 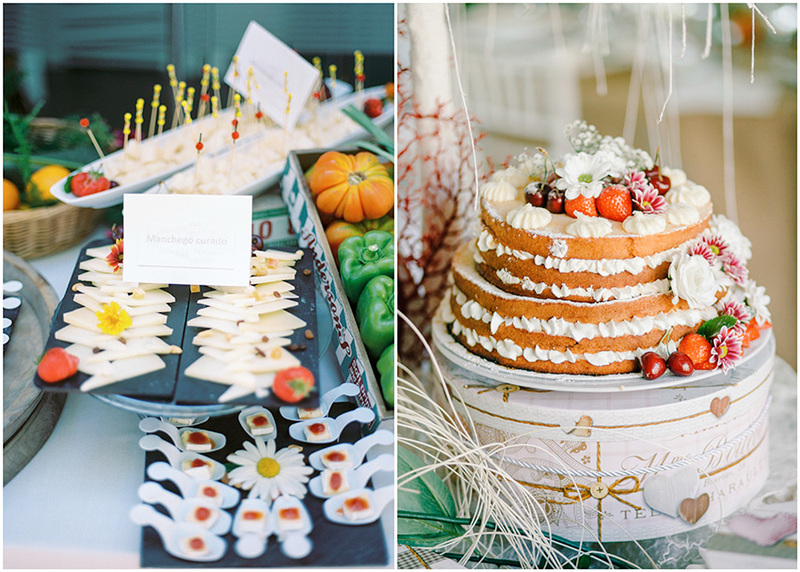 You can to make wedding on any place (in a mountains, on a beach, on a yacht). In different from official wedding, you can to make symbolic wedding on any platforms. It’s more simply for procedure of wedding ceremony. Symbolic wedding is relieved from paper efforts. For such wedding you don’t need to collect many documents and translate it on foreign language of country for wedding. You can choice a date of wedding, which you want, but not offered by employees of registering bodies. And, you wedding will be then, when you are wanting. You haven’t a time slips in a wedding day. When you have official ceremony that shifts on time so, something you won’t be in time up to the end or at all won’t make in the wedding day. 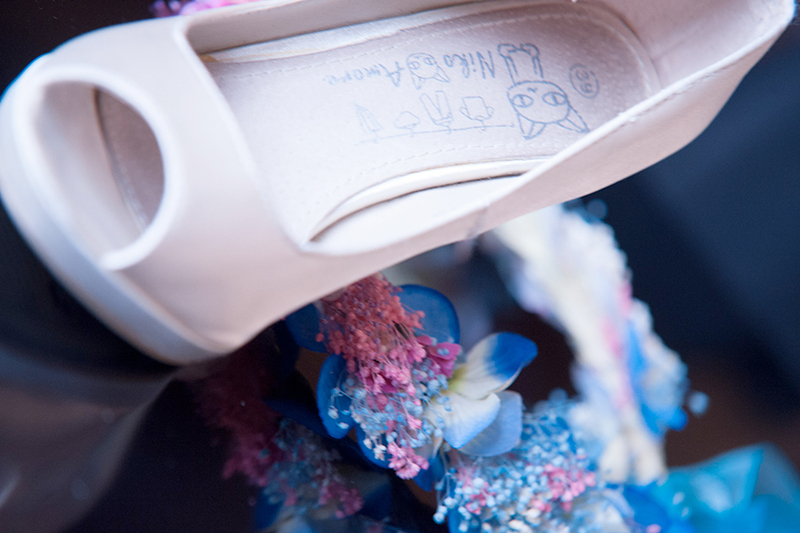 Symbolic wedding will be on your plan and the probability of temporary slips is minimum. You will save on a tax and a duty for registration of a wedding. Though it is a trifle, and it is pleasant! 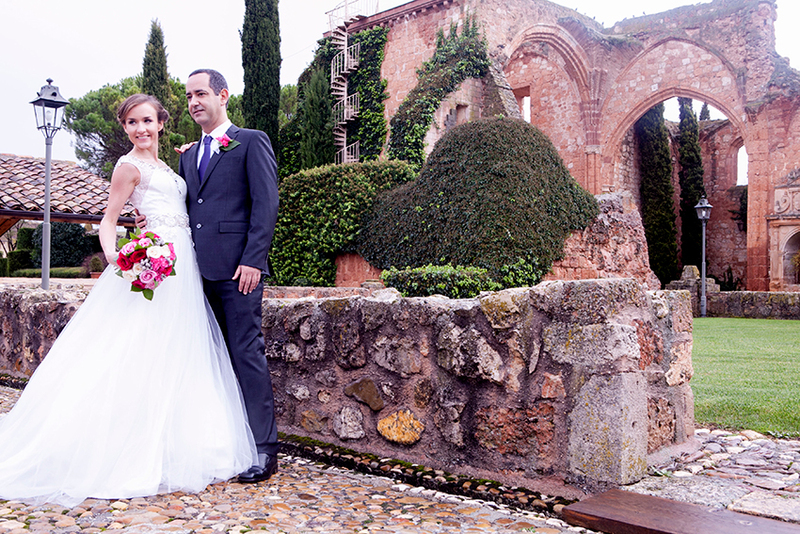 It was pluses of symbolic wedding in Spain. 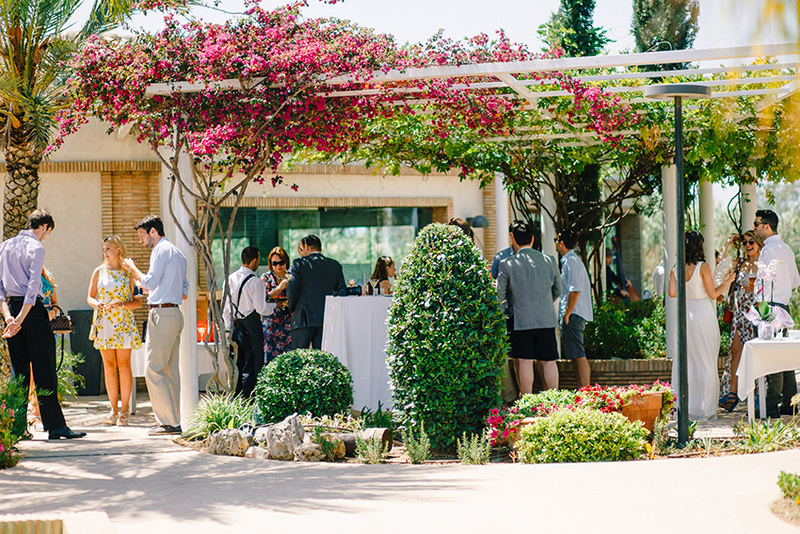 Further we will tell you about two interesting places in which it is possible to hold a wedding in Spain. One is some place be castle Buen Amor. It’s a wonderful and universal place. 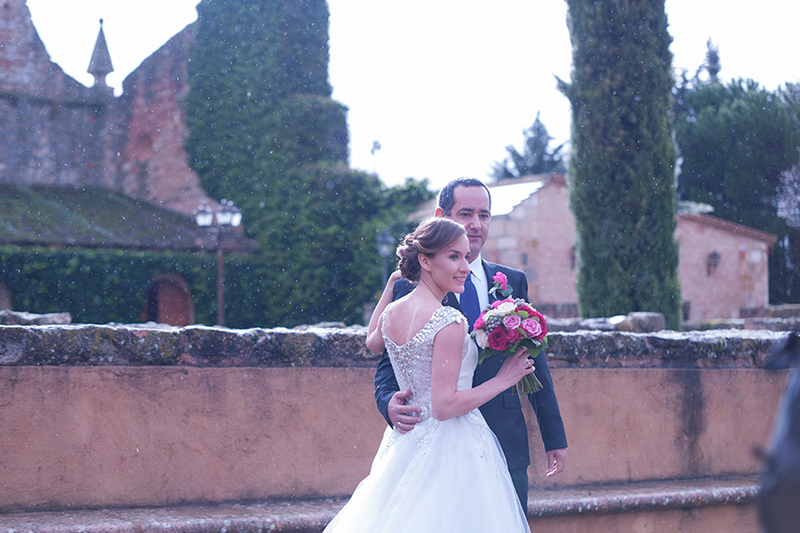 In this castle you can make wedding ceremony, banquet and stay in a hotel on all time of wedding. 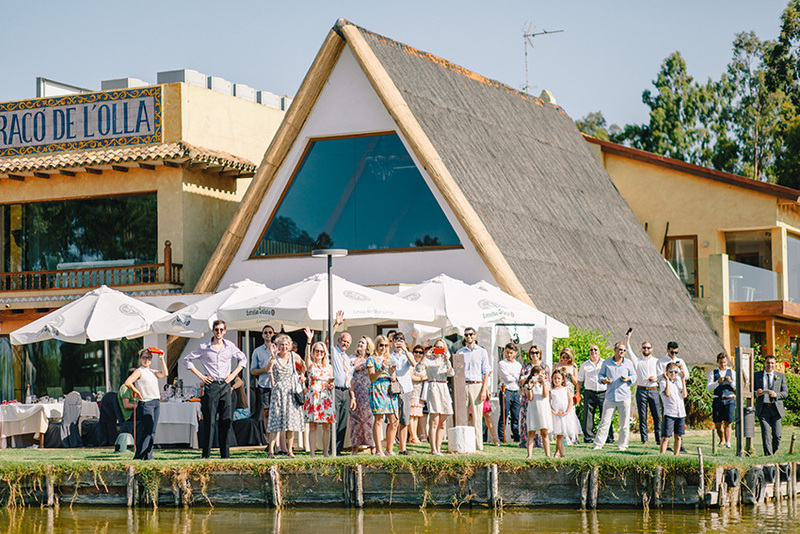 The lock open spaces are allowed to choice place for ceremony, banquet: it may be one of lock halls or open platform: Buen Amor has comfortable rooms such just married, such guests. 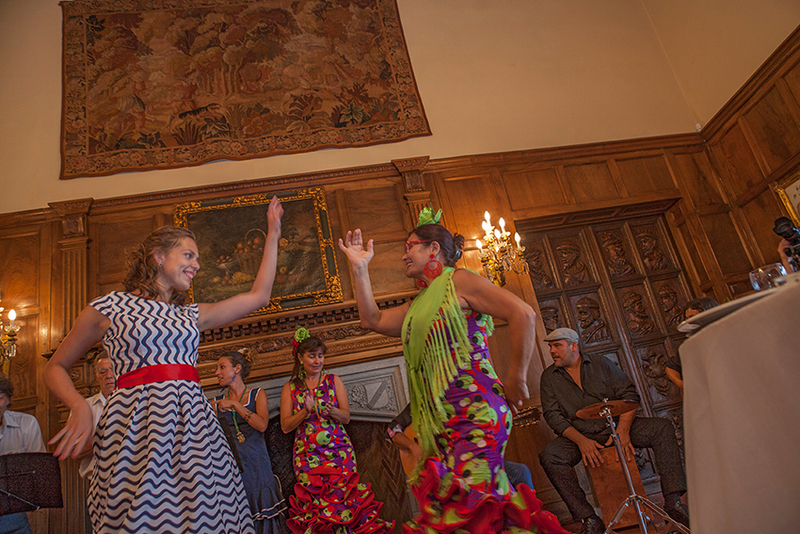 Also, we know one a fairytale place, its castle La Baronia. In this place you are touch to centenary history. Its elegant walls of modernist style era to give a refined charm to your wedding. Highlight of this place is sea at a foot La Baronia. 5 the best castle in Spain, which necessary to look, if you go to Spain. The hot Spain is not only many colors and gothic basilicas, but it’s medieval castles. And, if you go to Spain, you need to add 5 the best castles of Spain in your list of sights. So, castle Loarre is open our list of the best castles in Spain. This castle is a sight in square. It’s the oldest castle of Spain and its landscape used by Riddle Scott in his film “Kingdom of Heaven”. A territory of castle is 172 meters in diameter and consist church San-Pedro, old prison and gateway. It’s cool place for photoshoot. There is castle Belmonte in picturesque place. The wheat field and blue sky are surrounding it. This castle had kept its original state. Belmonte used by modern world: there is Medieval combative World Cup; the vaults and cellars are use for cinema, for example, such film as “Juana la Loca” by Vicente Aranda or “Flesh+Blood” by Paul Verhoeven. 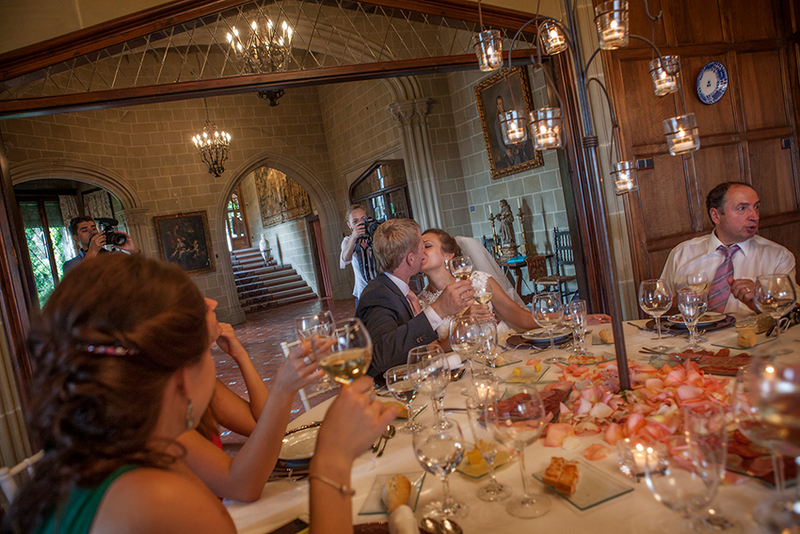 Besides, we can use the castle how place for photoshoot, for wedding or anniversary banquet. If you love the dramatized show, then the following lock to you it will be pleasant. There is Castillo Almodovar-del-Rio on a top of hill nearly Almodovar-del-Rio town. It’s amazing place with towers and inside yard. There is interest excursion and evening show, which name is @The Black Moon”. Alkasar in Segovia. This castle was inspired Yalta Disney to create the castle for Cinderella. Many towers this castle don’t stay indifferent nobody. If you want a photoshoot in this place, it will be fairytale. In the end, we would like to say about castle Olite. It was be royal castle and it interesting nothing own gardens, landscape, but it interesting opportunity to have a night in the castle, because there is Parador Hotel. It was 5 the best castle in Spain. Of cause, it’s not all castle in Spain, but, if you will see this some small part, you will open other Spain for you. It seems very difficult task, especially, when it’s your first wedding and it will be in unknowing country. Very sensitive ladies may be to pass, but don’t worry! We haven’t impossible in our world and such big and difficult task we will be solve on a little pieces. And we make a plan for successful wedding in abroad. Of cause, you can take a help of weddings organization, but if you wont to plunge in atmosphere of cooking to wedding, you need to use a simply plan. In begin, you need to defined, in which a style will be your wedding. It’s very important, because it help us to choose a place for wedding ceremony. You agree with me, that wedding in Hawaiian style is not possible in Germany. Also, you need decided about your budget for wedding. What is will be wedding? Its may be small wedding or very big, or maybe it is will be small evening. Number of guests is influence on a budget. The optimal variant of guests is only close friends and relatives. 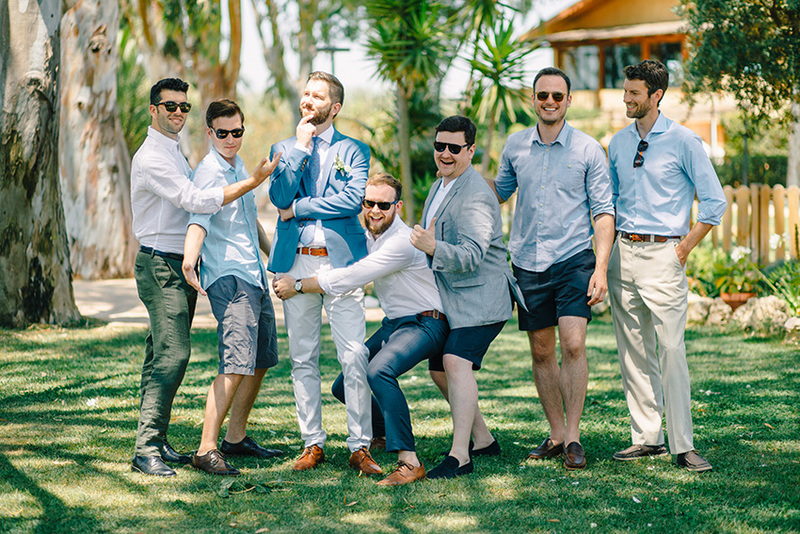 In organization wedding an abroad, we have a one an important moment. You need influence, which you need: symbolic or official? 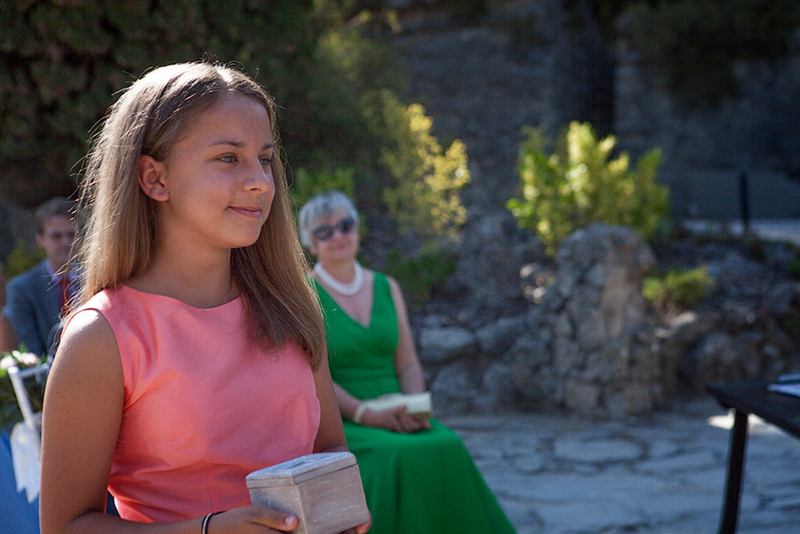 The easiest wedding an abroad is symbolic. 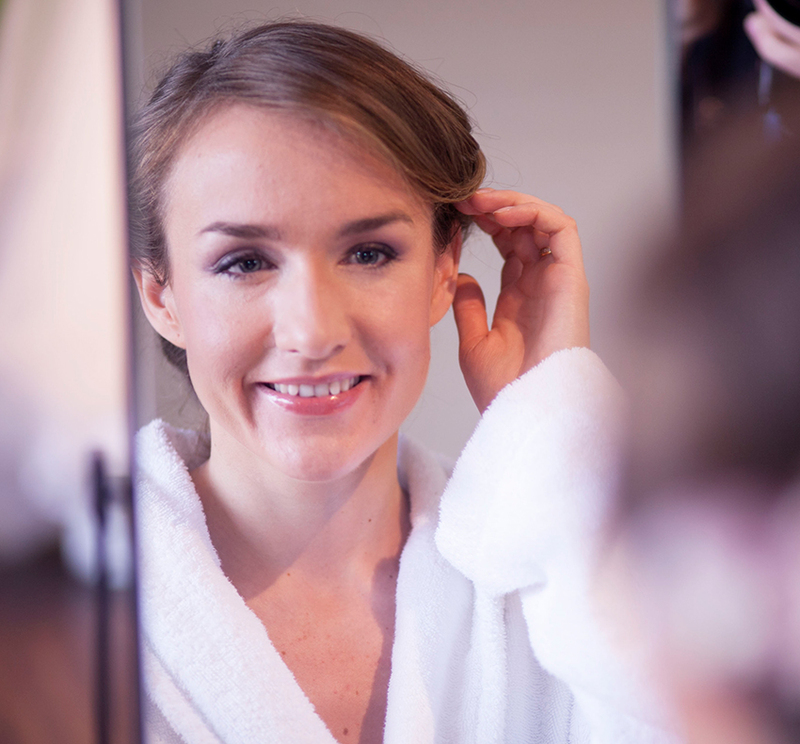 Preparation to wedding could begin until 6 mounts before a choice date. When you make previously stapes, you need think about place for wedding ceremony and celebrate. Important know, that not all places you can use for ceremony without agreement with administration, therefore it will be better, if you choice a place without such problems. You can use a territory of restaurant, for example. The next step of plan it a transport and transfer. You need booking a ticket on airplane and think about other transfer from airport to hotel and other place in weddings day. For example, you can rent a car or bus. Also, you could care about place of living for you and your guests. If you have many guests, you can book all hostel, for example. Still you could include such costs, as food, photographer, stylist and décor of place for wedding ceremony. 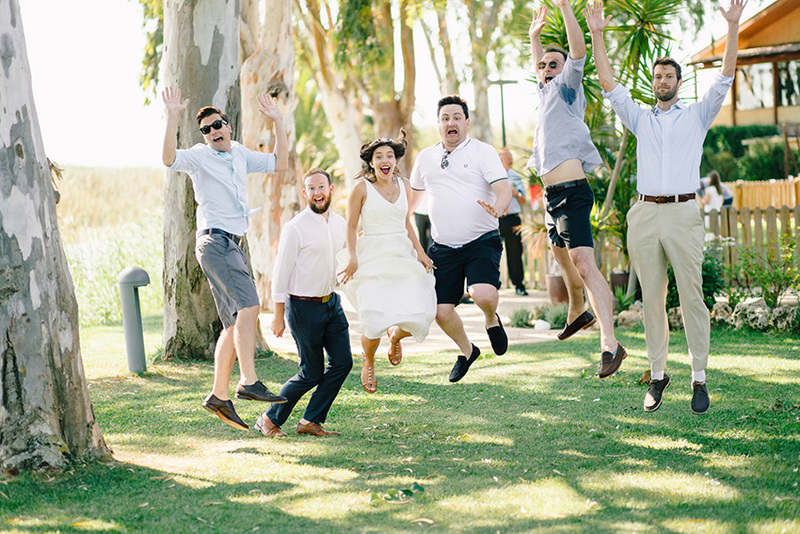 It was our a little advice, how to organize a wedding an abroad yourself. 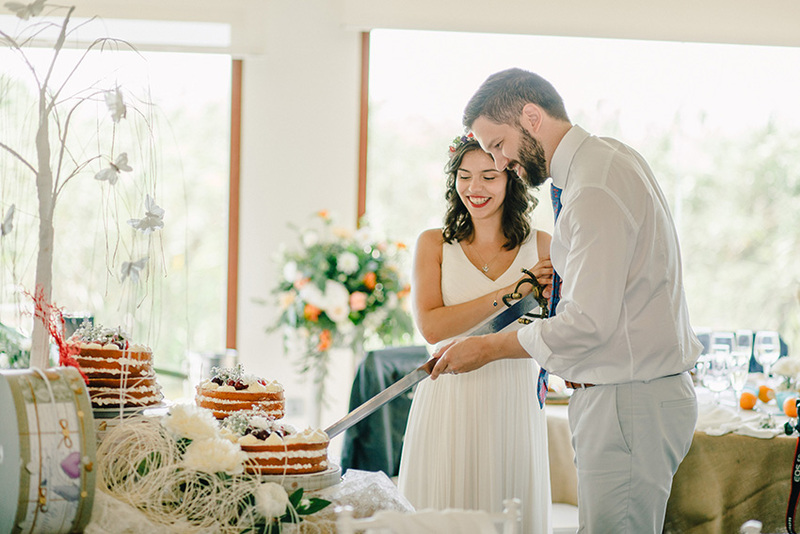 And, if you still want a wedding an abroad, that we wish you good luck and believe, that you do it! 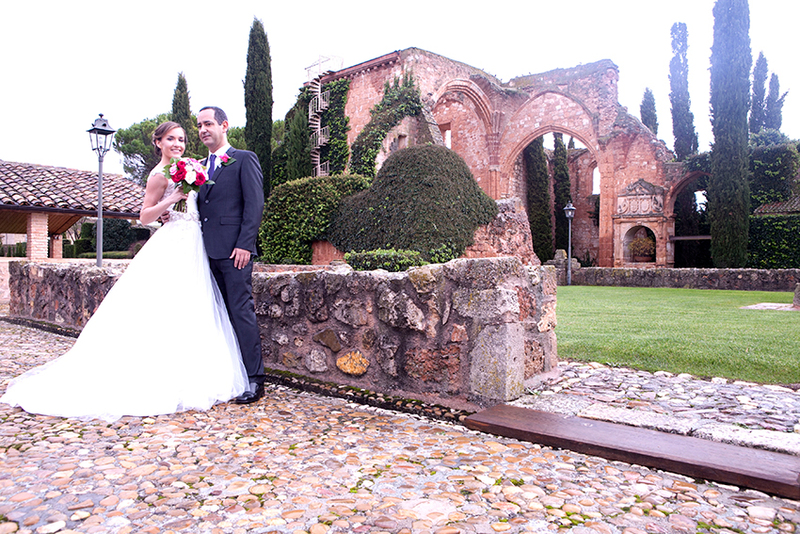 Wedding coordinator – is a professional who performs on the “scene” directly on your wedding day. 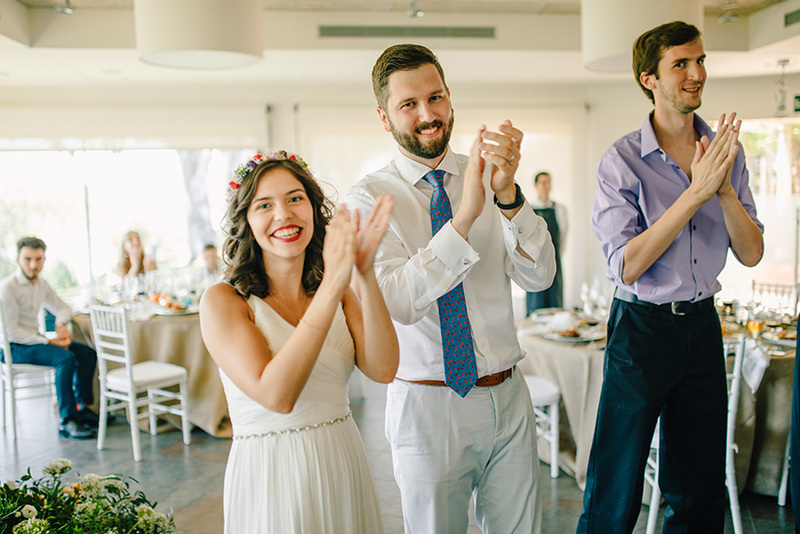 He or she cares about agenda designed by wedding planner, watches out of all details and makes the celebration process perfect from the very beginning of the day till the time of last guest’s departure. 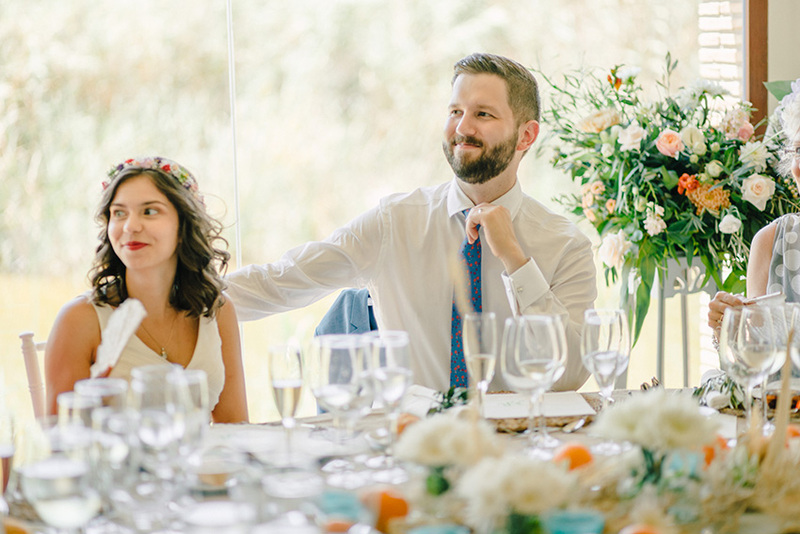 One important point: the wedding coordinator in Spain – it is all above plus a translator. 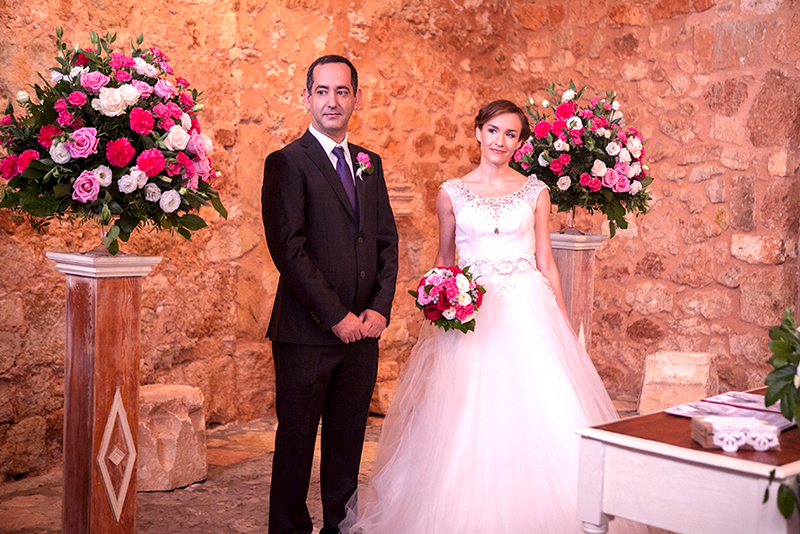 This is a person who can help the bride and her guests at any time, communicates with local staff and resolves any misunderstandings and problems. Here in Spain, coordinator must speak not only English or Spanish, but often local language Catalan. I can say without any doubts: me and my team speak perfectly all these languages! Wedding Coordinator tracks all the steps according the event timing and makes everything in time. Also he or she is responsible for the well-coordinated and efficient work of hired professionals – make-up artists, photographers, musicians, florists, etc. 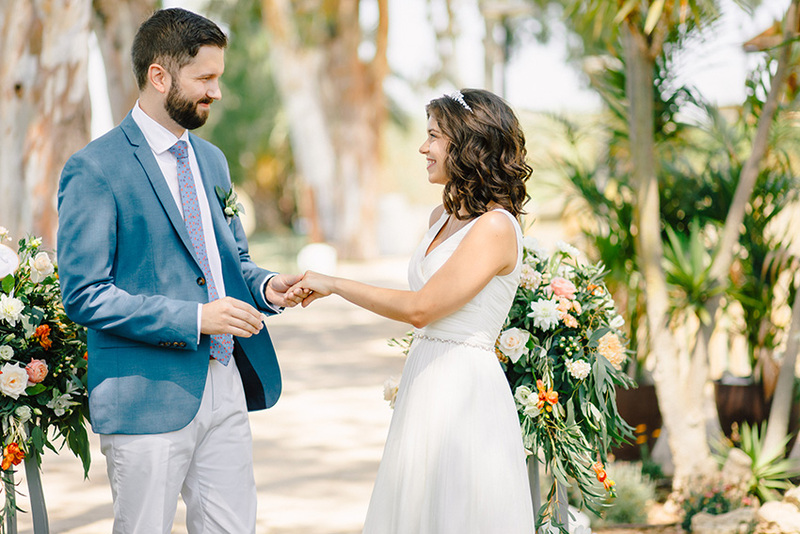 Coordinator remembers what time artists or photographer should arrive, who keeps the rings at the ceremony and what to do if the rain starts or bride’s heel is broken. And – yes, a good coordinator in Spain – this is a special kind of fairy, who is always in the right time in the right place and resolves all the problems. For example, coordinator’s purse is full of completely unexpected, but necessary at the moment things. Threads with a needle, pin and hair spray, comfortable shoes for tired legs, a sedative and analgesic medicine, USB flash drive, wet wipes, etc. 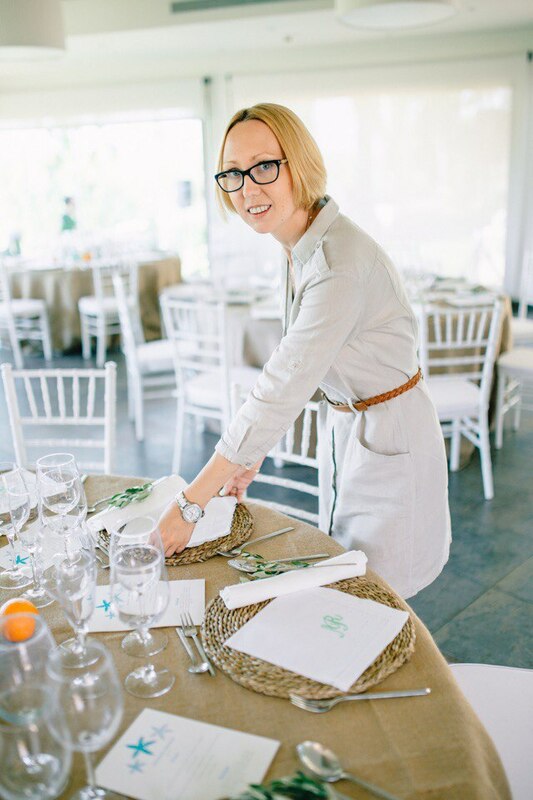 Wedding coordinator supervises all the wedding stuff – up to a little piece! 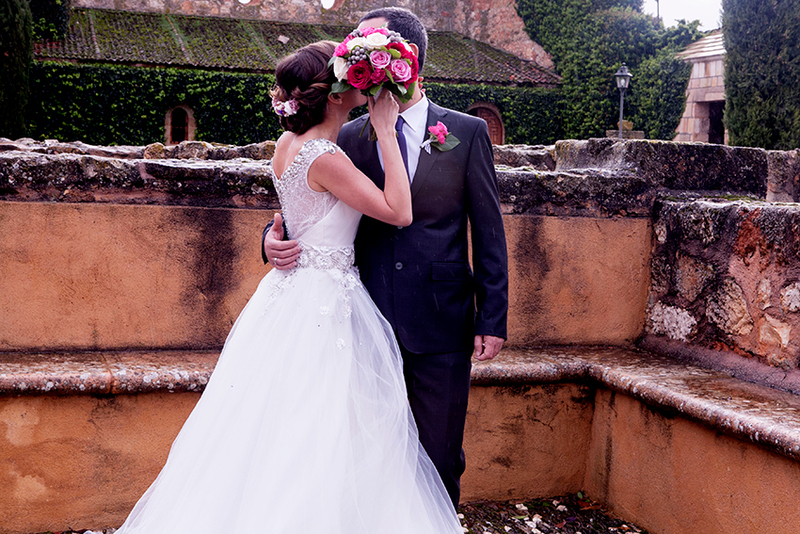 The appropriate arrival of stylists, makeup/hair for a bride, flowers, bridal bouquet and groom’s boutonniere, decor for the ceremony or banquet hall – floral compositions, furniture and accessories. Coordinator guides the transport on wedding day and controls all the movements of the bride and groom and their guests. He or she meets latecomers (or vice versa, early birds) and escorts them to the place of the ceremony. 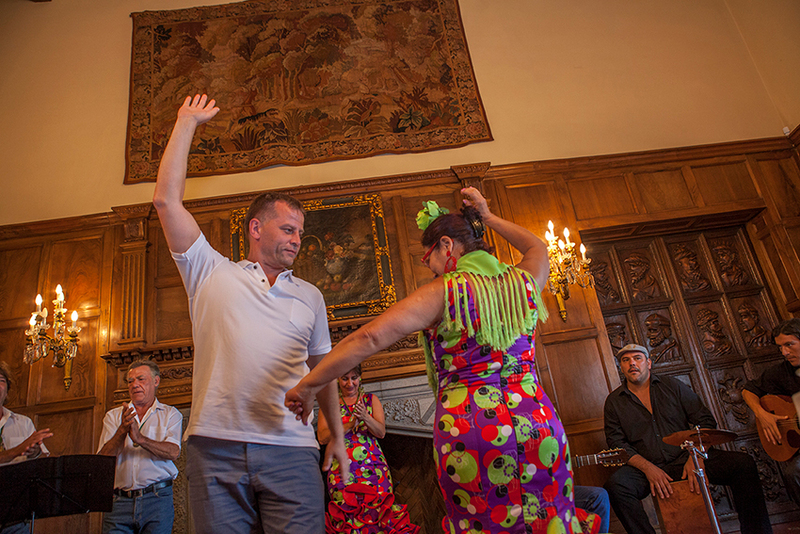 If you decide to visit the castle or beautiful historic park, the coordinator will make the smooth entrance – here in Spain there are some places which require special or pre-purchased tickets for every guest. And the wedding coordinator will check the photo and video permission and etc. 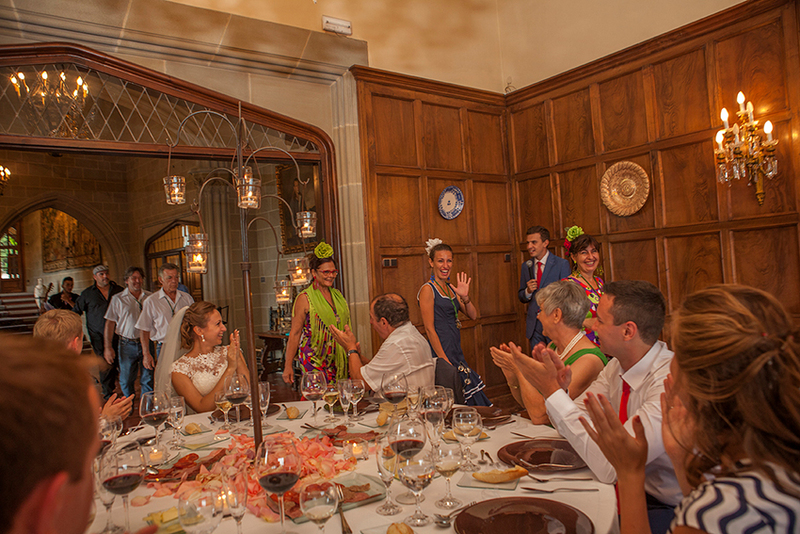 During the dinner coordinator monitors the efficient work of waiters, musicians and other professionals. Also coordinator is the person who pays vendors at the end of the celebration. To be honest, I believe that the bride’s goal – to enjoy the wedding, wedding coordinator’s goal – to ensure everything makes the bride happy. 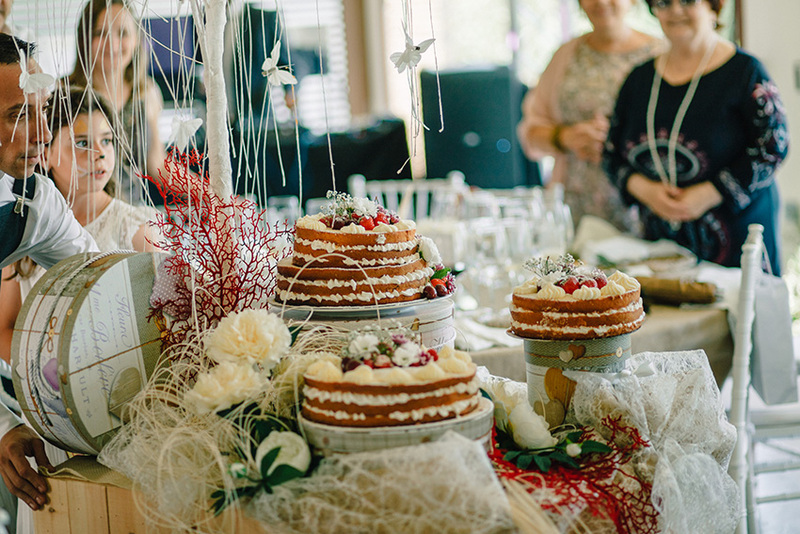 For my dear clients I prepare a special gift from my heart – if you order a wedding organization in the Natalia Ortiz agency, Big Day’s coordination of any complexity is included in the cost of the wedding! 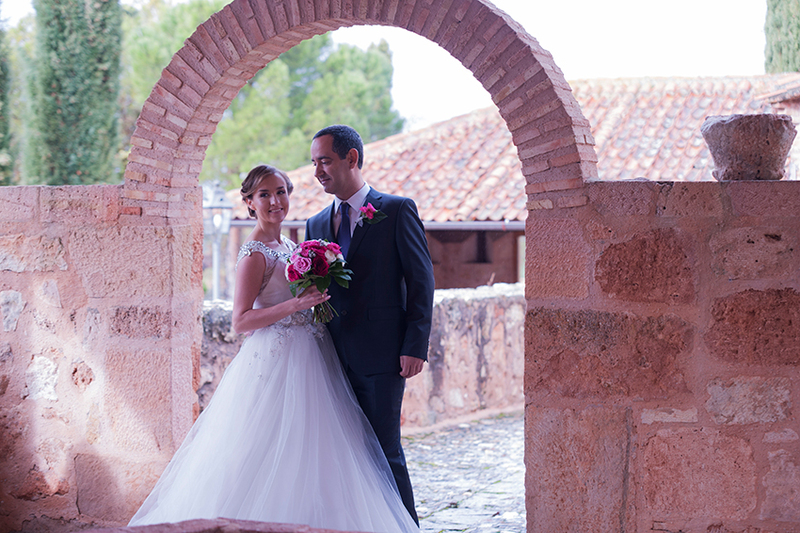 And of course, Wedding Agency by Natalia Ortiz provides the service of wedding coordination in Spain absolutely to all couples who have planned their wedding in Spain by themselves and who wants to enjoy their beautiful day! 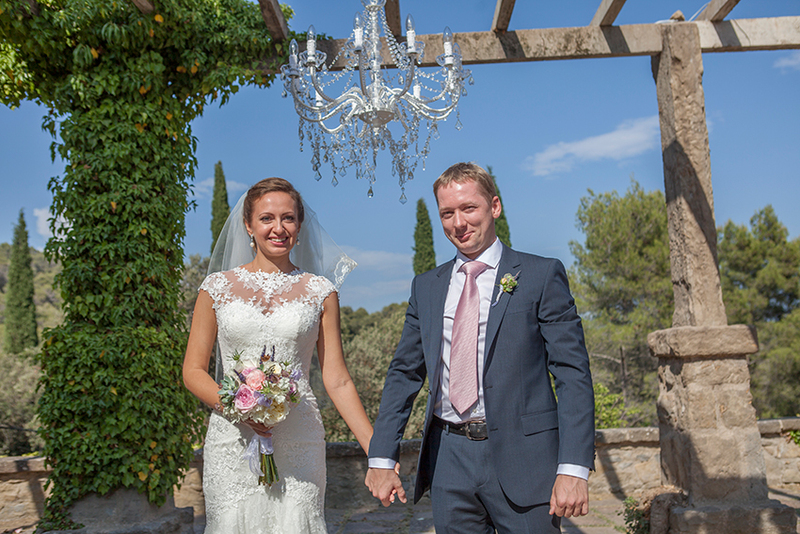 Anastasia and Richard are a Russian-American couple, who trusted us to organised their wedding in Valencia. 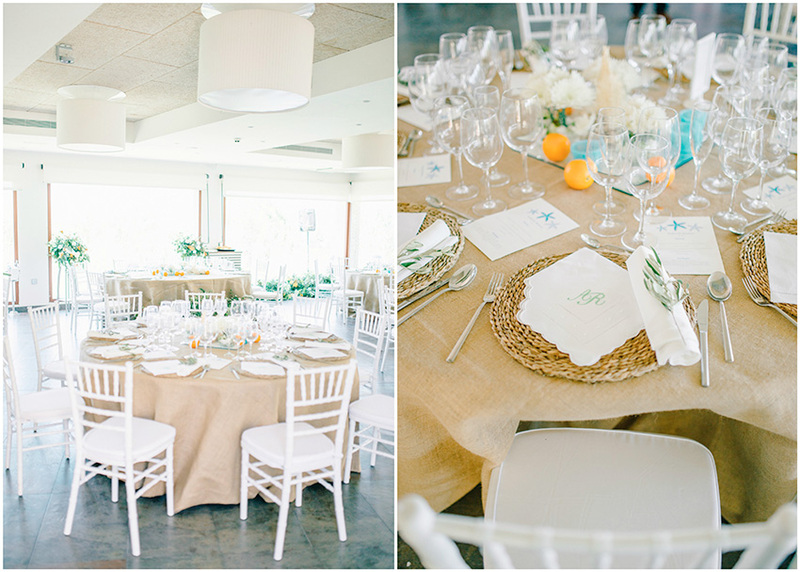 It was a wedding where simple decoration, light and orange color flooded the space, both exterior and interior. 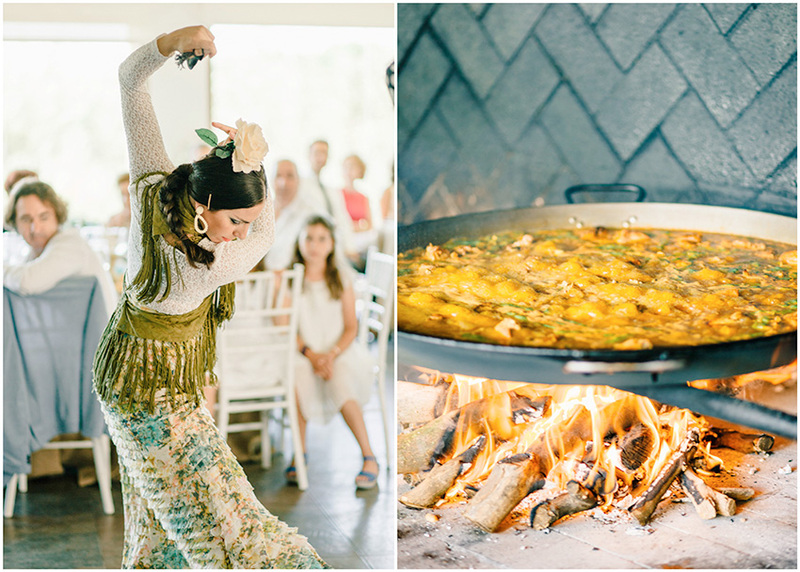 As the guests were foreigners, at the wedding there were several typical Spanish activities, such as a flamenco show and paella show cooking. Everyone enjoyed it! 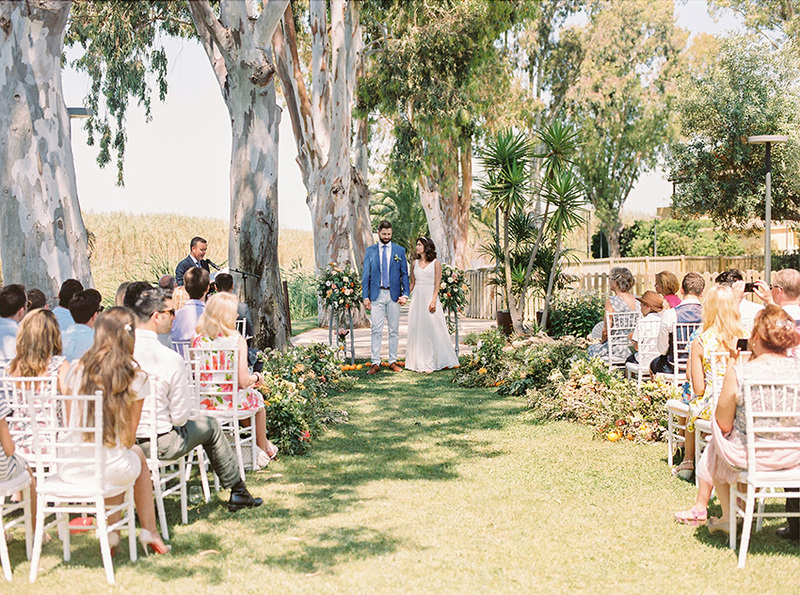 The ceremony was held outdoors, with white chairs and a wooden altar. 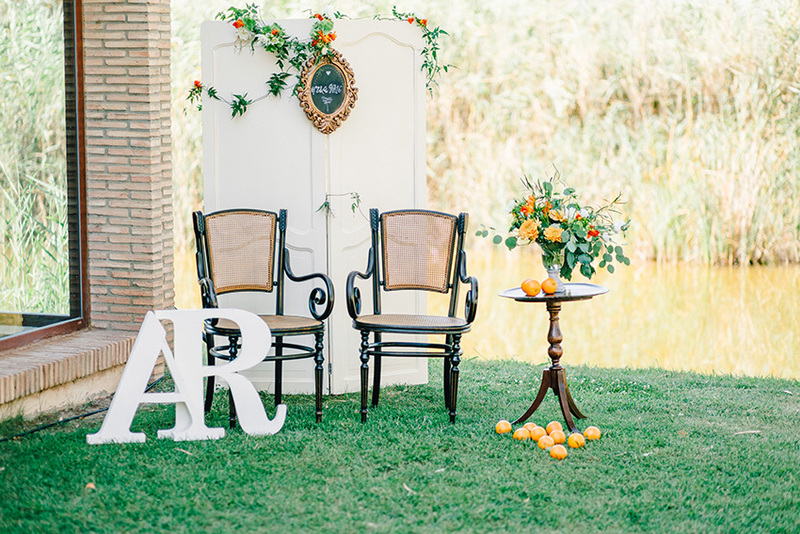 Everything was adorned with abundant vegetation and with oranges, since in Valencia they are the best in the world. 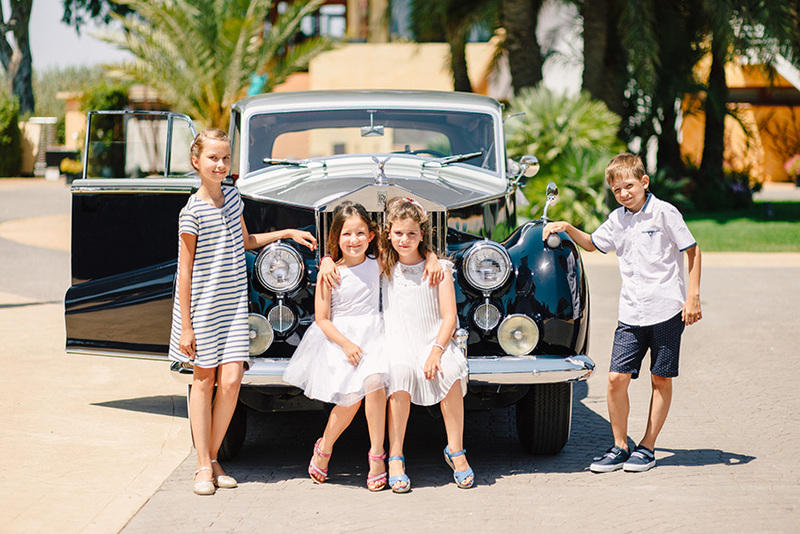 The bride arrived in a spectacular vintage black car, wearing a simple dress that suit her greatly, with wavy hair and a white headband, which was later changed to a wreath of colorful flowers. 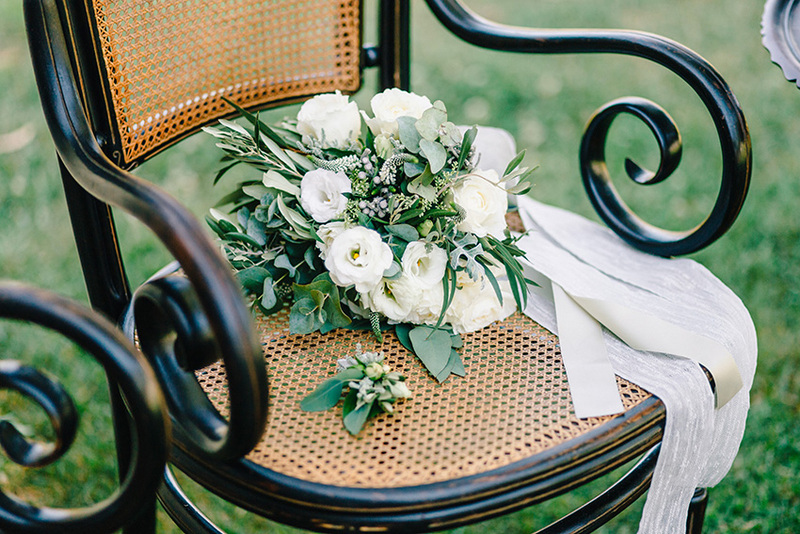 In her bouquet, green and white predominated. Richard was waiting enthusiastically at the altar, dressed in beige pants and a blue tie, a young and elegant look. The cocktail was held outdoors because the day was magnificent. 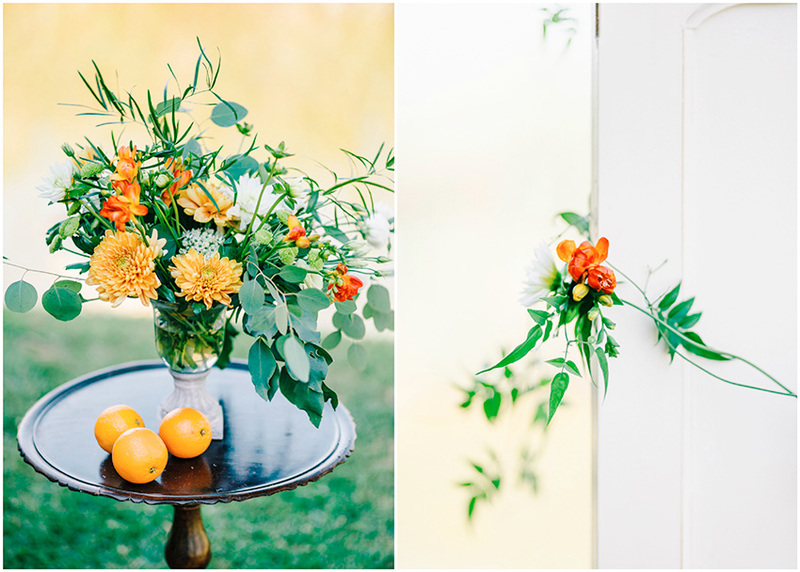 For the indoor banquet the tables were decorated in neutral tones, but again with abundant flowers and oranges. The sweetheart table was spectacular! 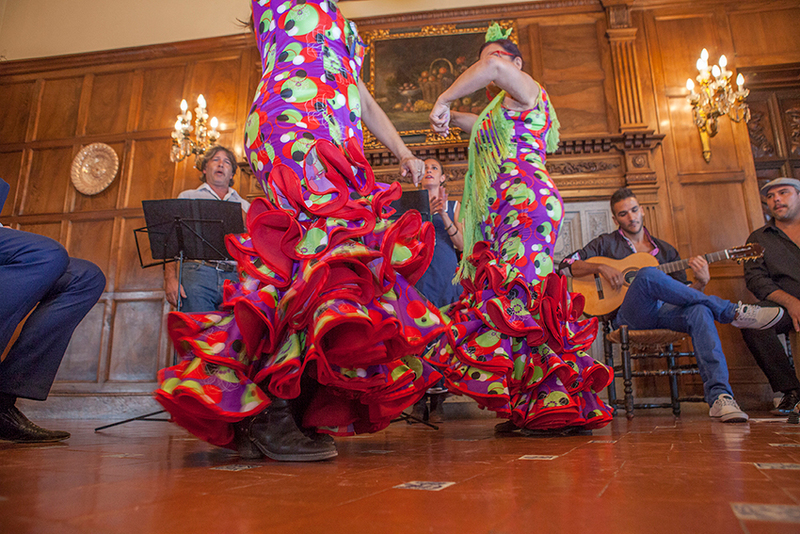 After the banquet, the guests were able to enjoy flamenco dancing and paella show cooking. 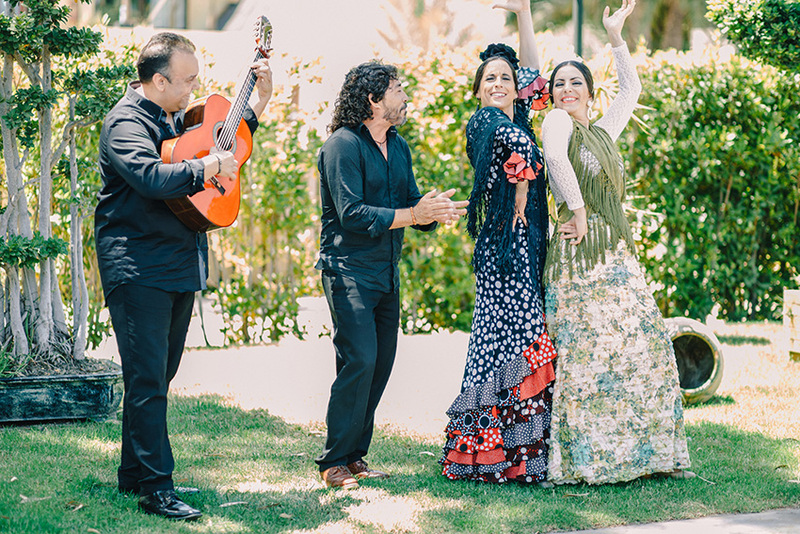 Would you like to celebrate your wedding in Valencia like this couple? We show you below all of the pictures ! 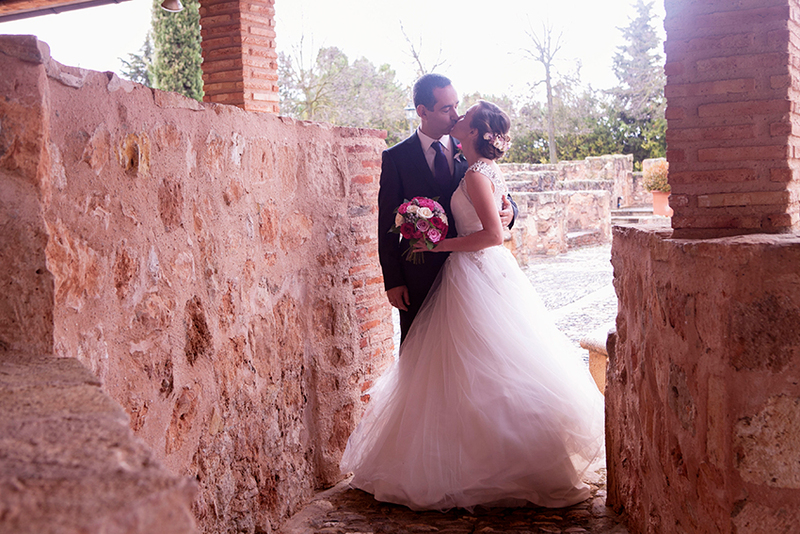 Oscar and Natalia’s wedding took place on a beautiful estate in Madrid. 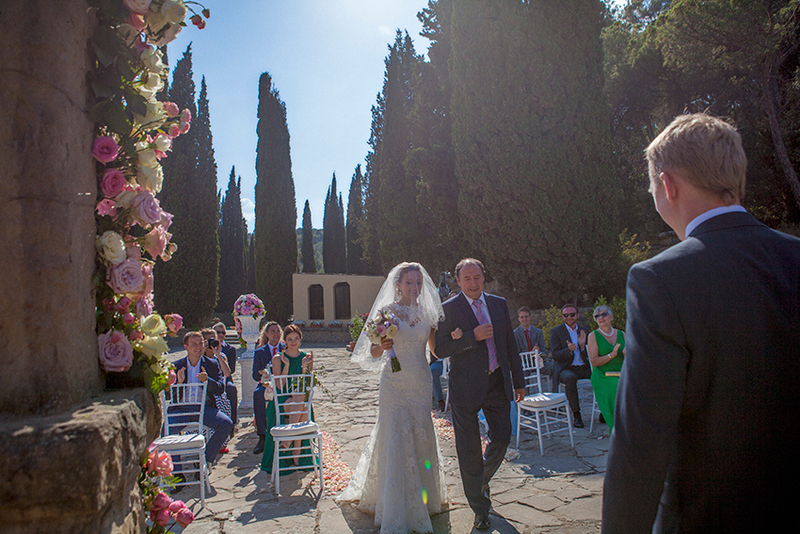 It was a magnificent Madrid wedding and today we want to show you how fabulous the day was – we hope you like it as much we do! The setting was gorgeous, a lovely stone estate which was quite medieval in style, surrounded by picturesque, green gardens. 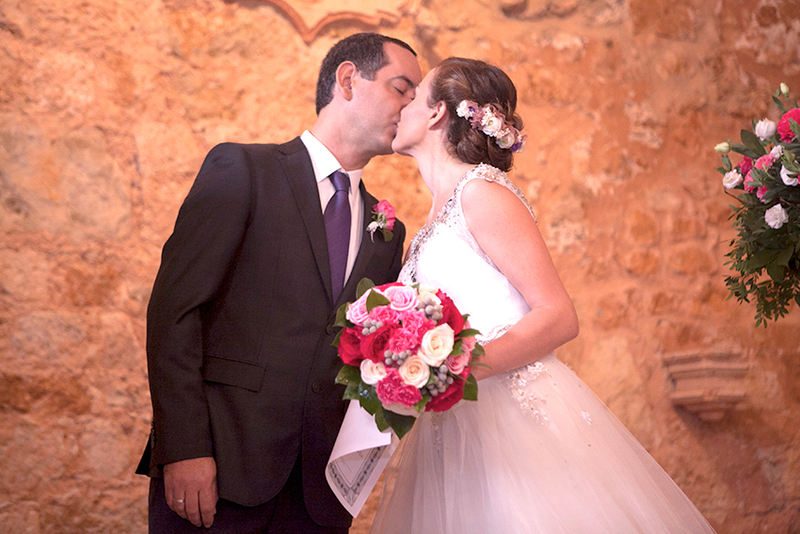 The ceremony for this wedding in Madrid took place indoors, in a room with exposed stone walls and white beams on the ceiling which made the room lovely and bright, as well as traditional in style. 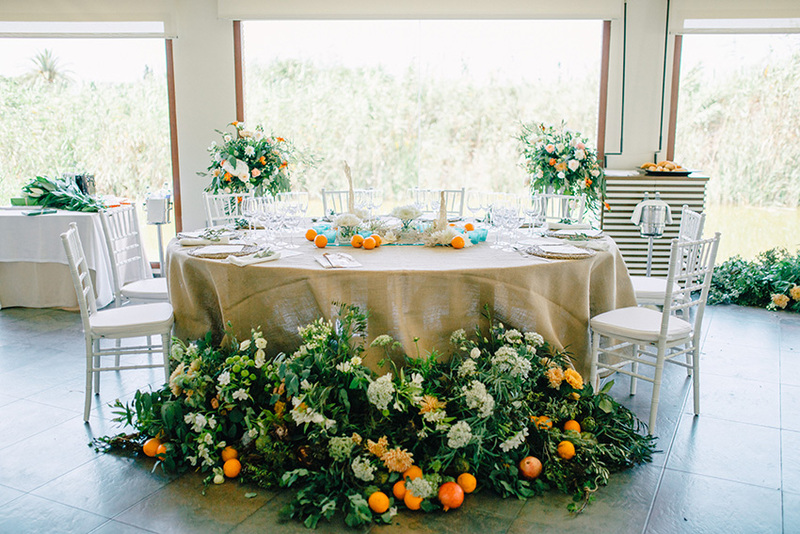 The guests sat on white chairs which matched perfectly with the colour of the ceiling and the room was decorated simply but elegantly, with a few flower arrangements near the altar. 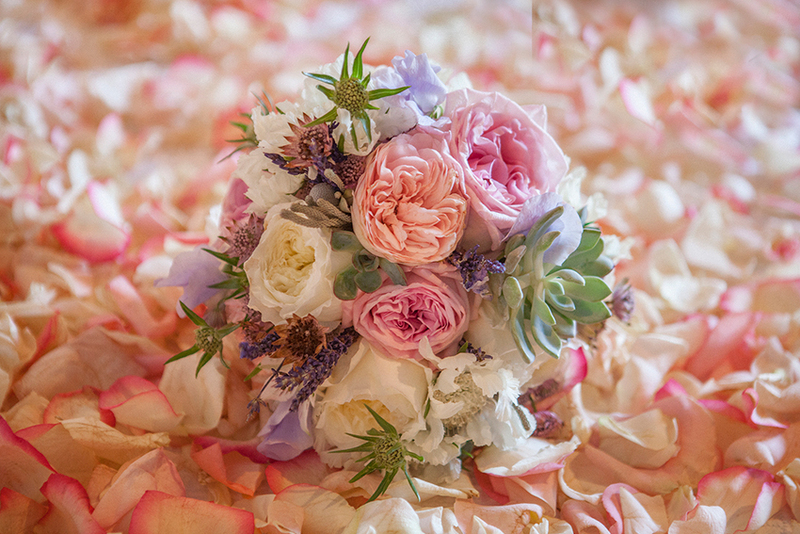 The flowers contained strong pink tones, which contrasted amazingly with the room and matched the bride’s bouquet. 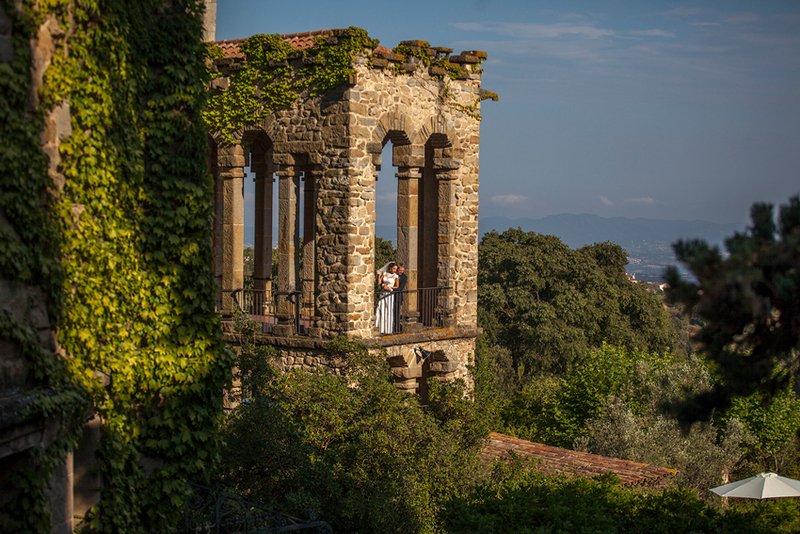 After the ceremony, the bride and groom had a photoshoot in the stunning outdoors surrounded by the fantastic stone pillars. Both the bride and groom looked incredible on their big day. 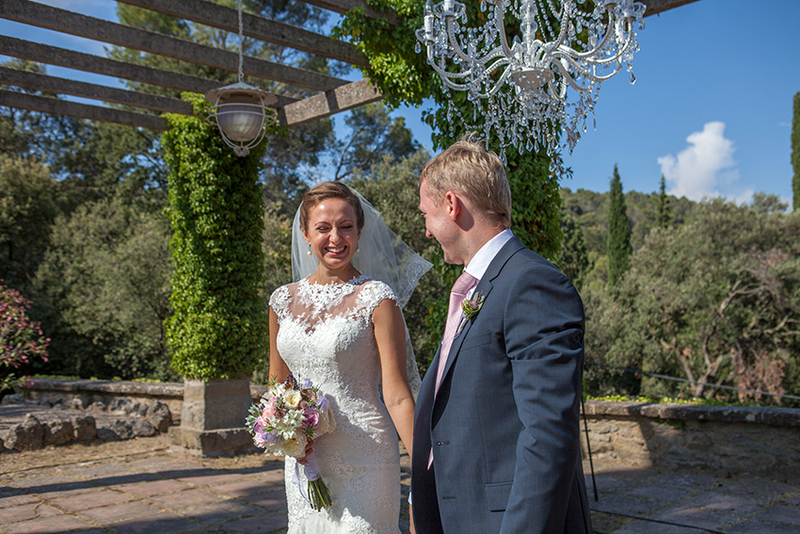 Natalia wore a wonderful dress with lots of sparkling details and a big netted skirt. The dress also had a beaded belt which added another glamorous detail to her dress and was very flattering. She wore her hair in a loose updo and she looked absolutely beautiful. Oscar wore a smart black suit with a white shirt and a navy tie. 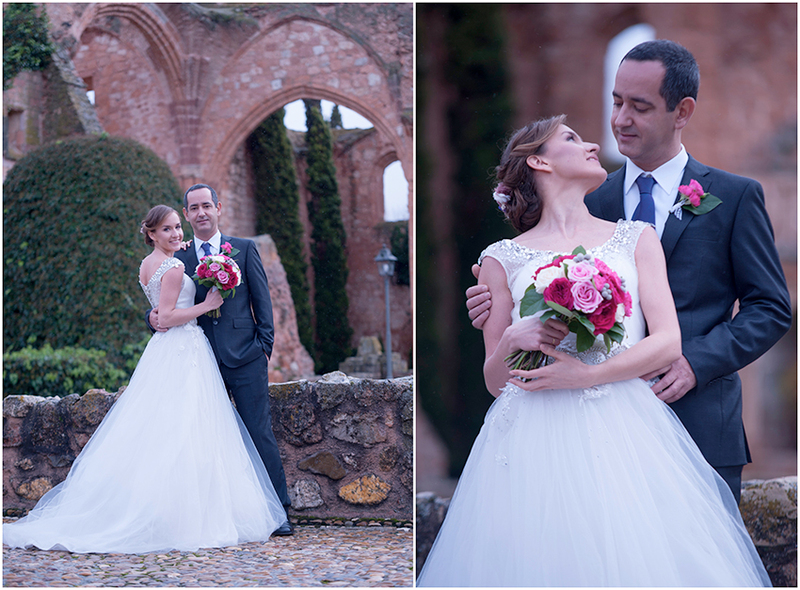 He wore a dark pink flower in his jacket which matched perfectly with Natalia’s bouquet so the couple were in harmony. 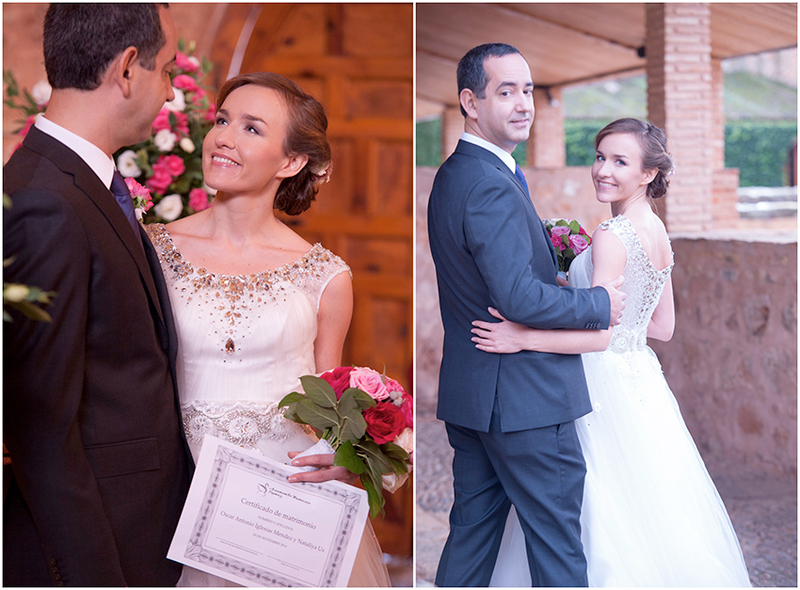 We really enjoyed planning this special Madrid wedding and we couldn’t have been more happy with the result. 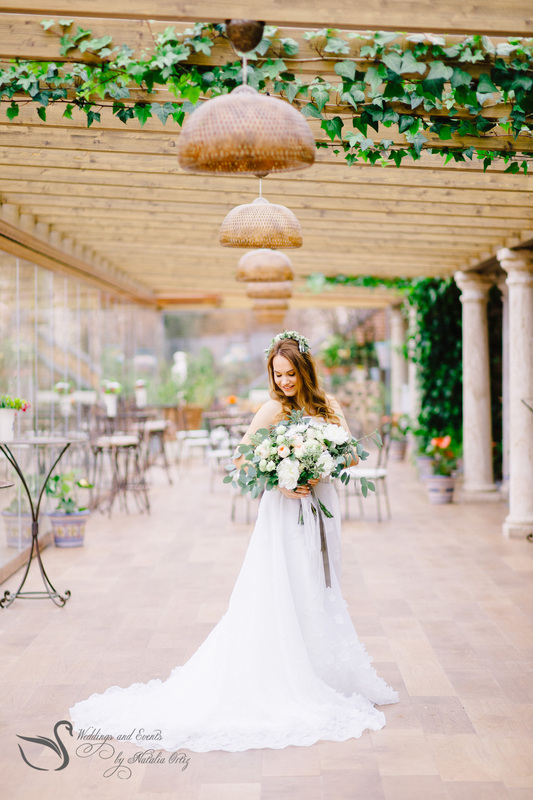 If you are interested in letting us plan your own special day, you can write to us at info@svadbavispanii.ru. 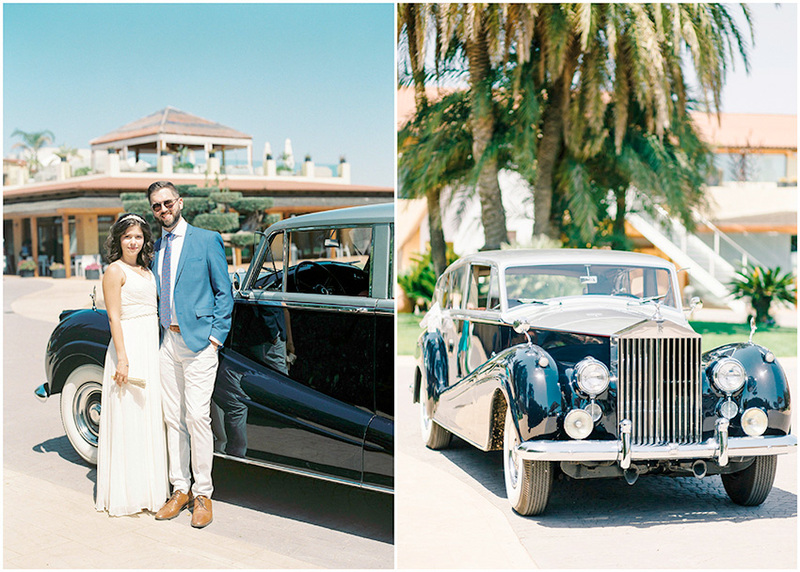 In today’s article we want to share with you the beautiful wedding of Viktoria and Dmitry. 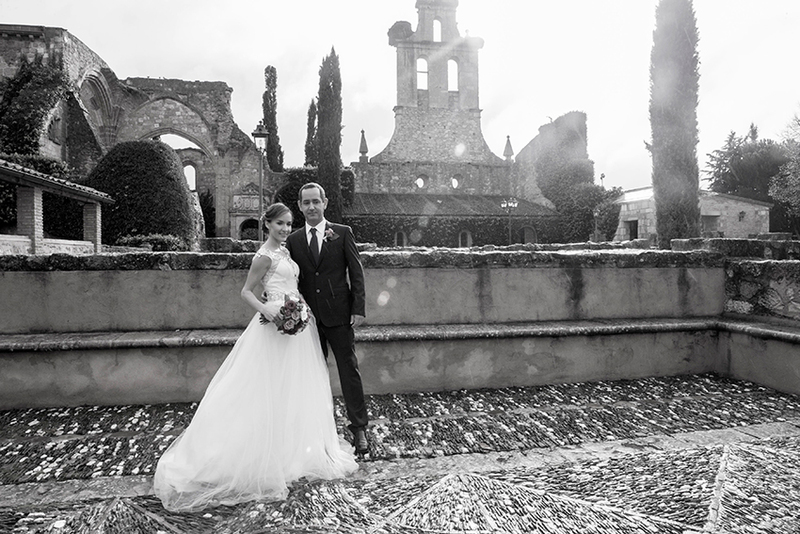 They got married in the amazing Spanish Castle Buen Amor in Salamanca. It was an unforgettable day, filled with happiness. 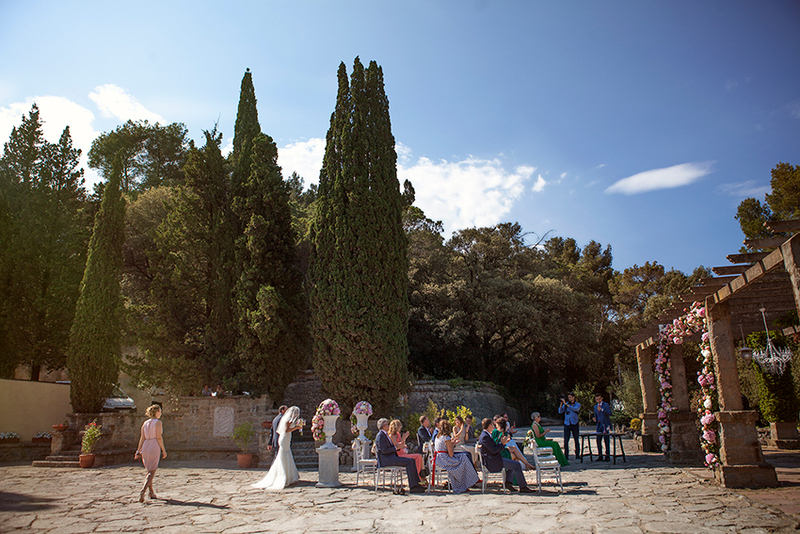 The ceremony took place in the lovely courtyard of the castle, and there was a live orchestra which made the atmosphere very romantic. There was plenty of space here for all their guests and it was very bright. 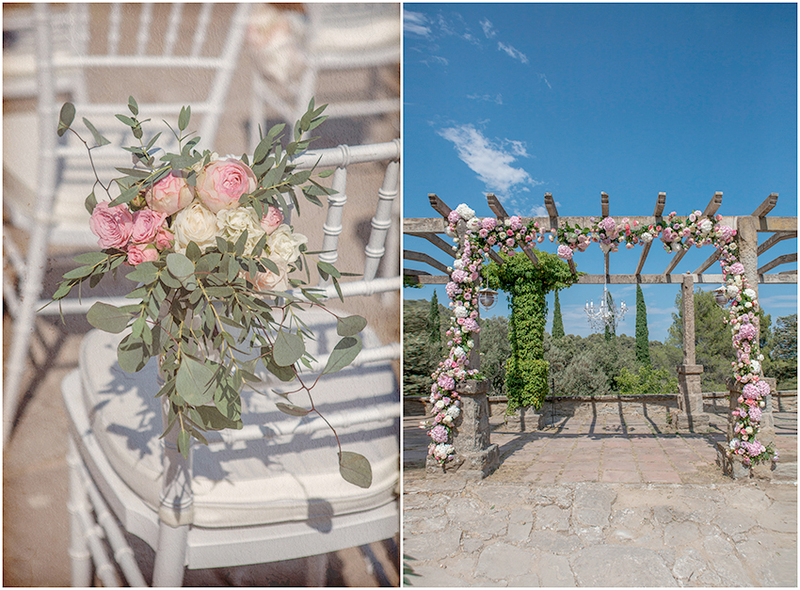 The ceremony area was decorated with stunning flowers which added a touch of colour to the space. 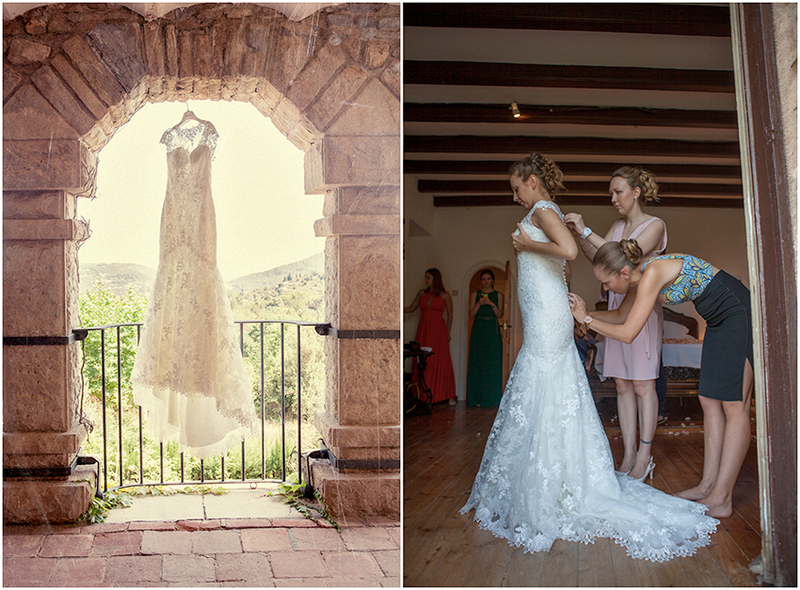 Behind the bride and groom was a white lace curtain as a backdrop for when they said their vows – a beautiful touch! After the ceremony, the guests released silver balloons before going for photographs together and for the cocktail reception. Whilst the couple had their own private photoshoot, the guests enjoyed their drinks and canapes before moving inside for the banquet. 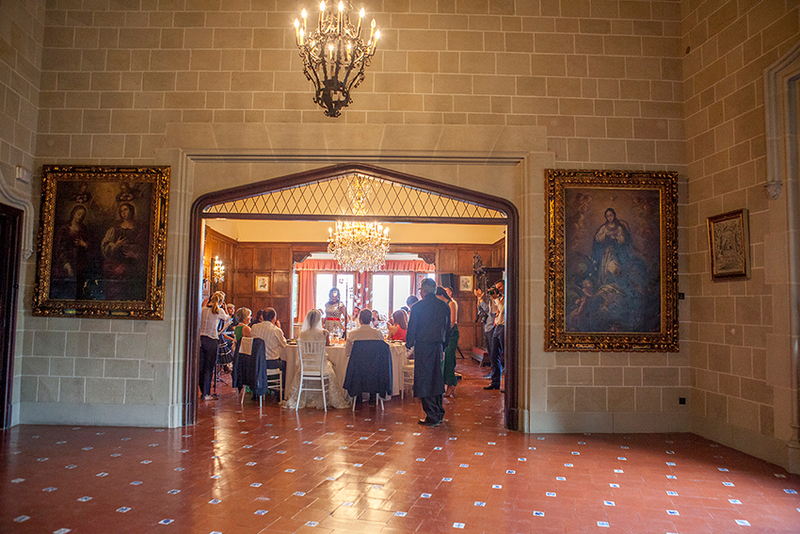 The banquet was held in a romantic room in the Spanish castle with light stone walls. There was a long table with a white cover which everyone sat on. The table was decorated with candles down the middle which created a warm ambiance. 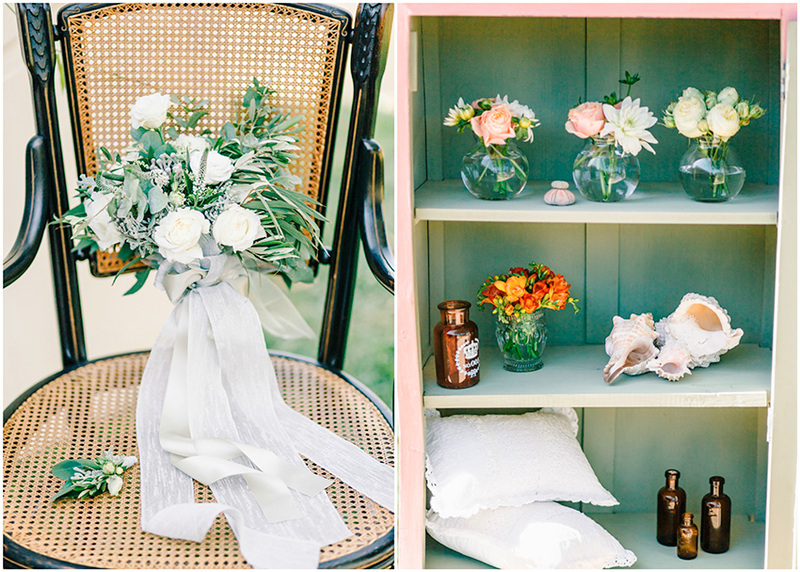 There were also some small pretty flower arrangements which gave the room a more nuptial appearance. 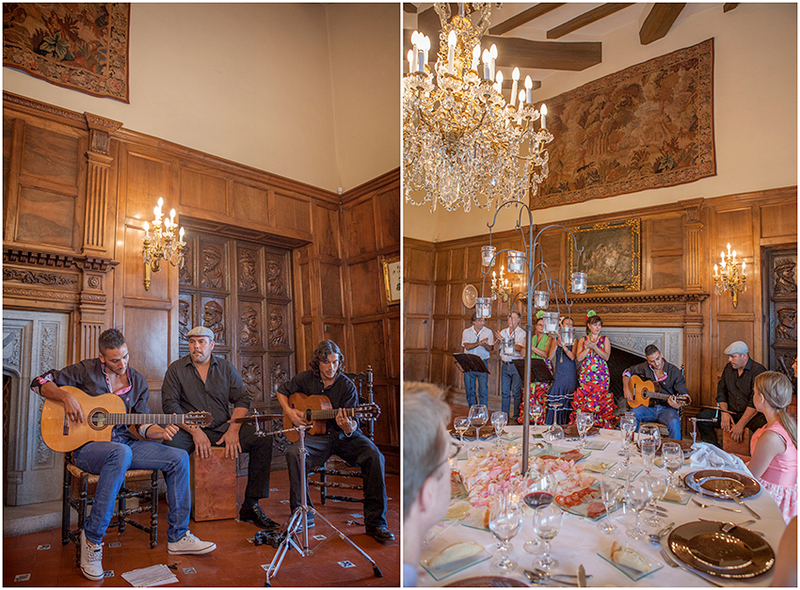 During the banquet, family members did speeches and there was another live music group which everyone enjoyed. Finally, the guests moved into another room with a dance floor for the party. There was lots of singing and dancing and everyone felt involved and very happy. 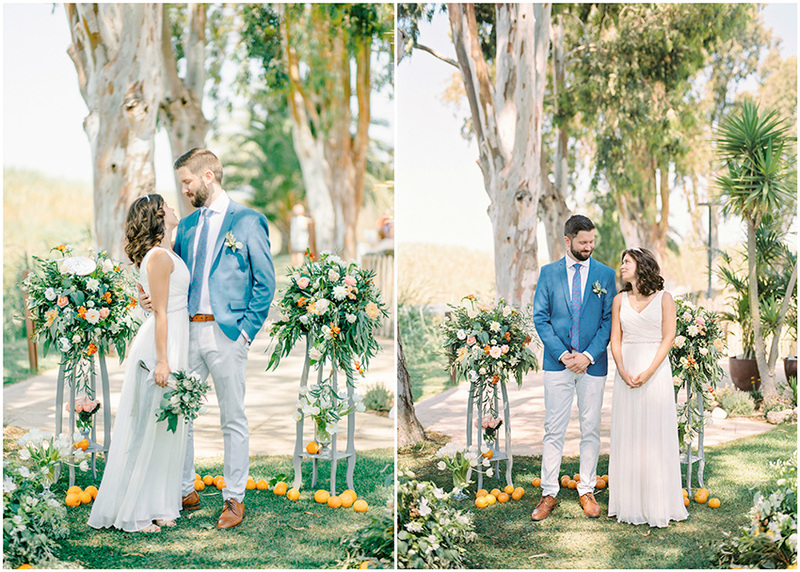 Now let’s talk about the style of the bride and groom. 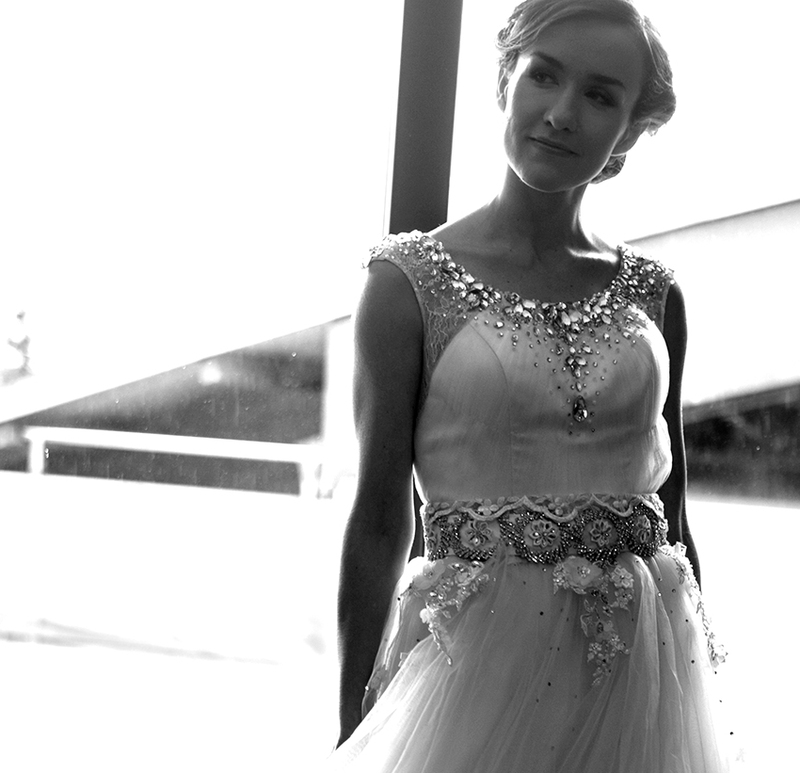 Viktoria wore a figure hugging white dress in a lace material with some subtle beading. She wore her hair in a neat bun with a short netted veil over her face for the ceremony. 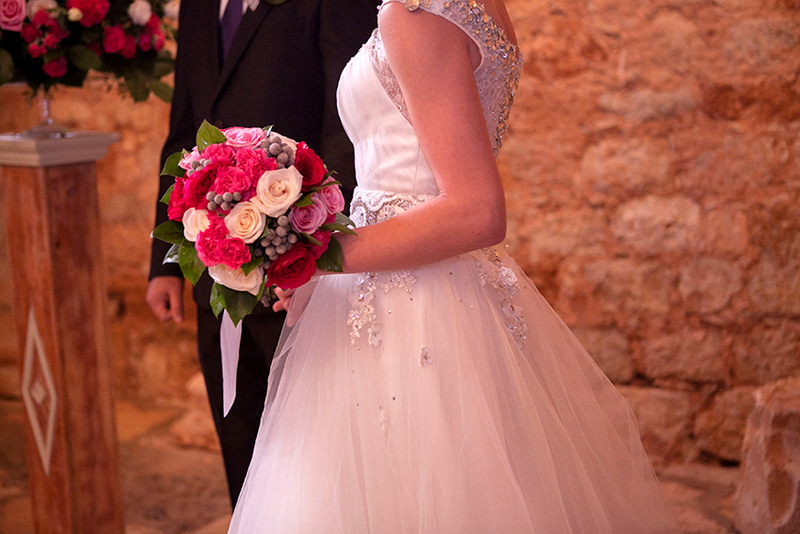 Finally, she carried a stunning bouquet of white and pink flowers. As for Dmitry, he wore a dark grey suit with a white shirt with black buttons, accompanied with a white dicky bow tie. Very smart! 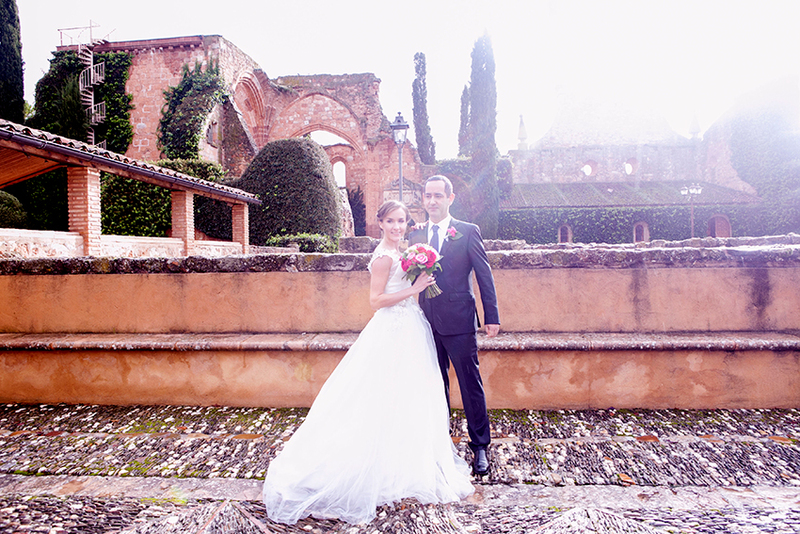 This wedding in a Spanish castle was a fantastic day. 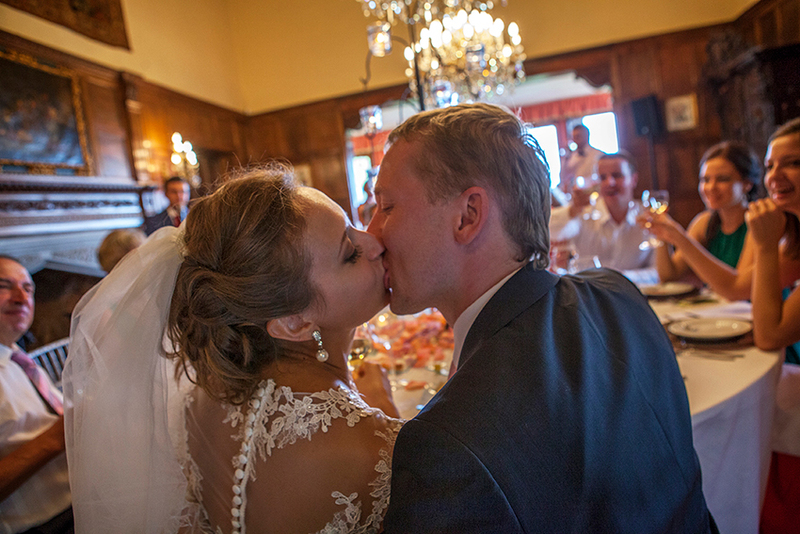 We couldn’t be more happy for Viktoria and Dmitry – congratulations! 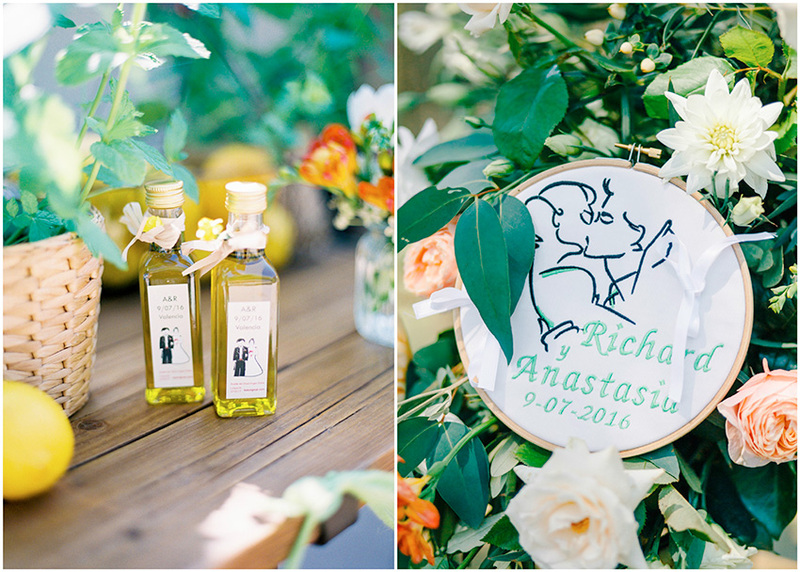 If you wish to team up with us to make your wedding a success like this was, you can write to us at info@svadbavispanii.ru. 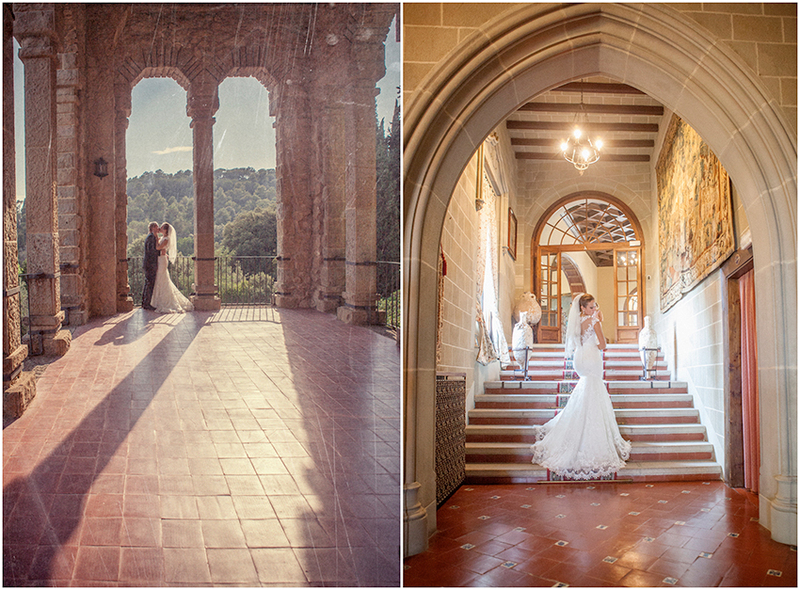 Denis and Olga chose to celebrate their wedding in the breathtaking Spanish castle La Baronia. 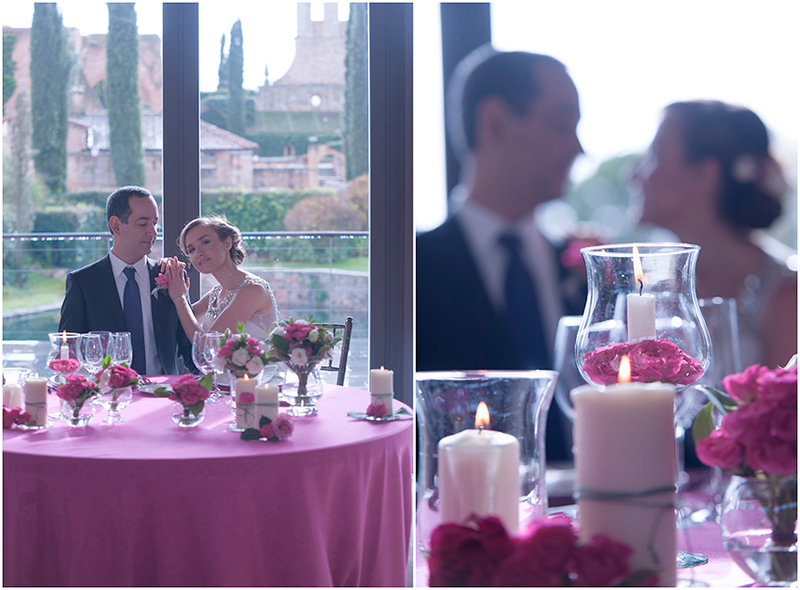 It was a perfect location for their stunning day that has created unforgettable memories for the couple. 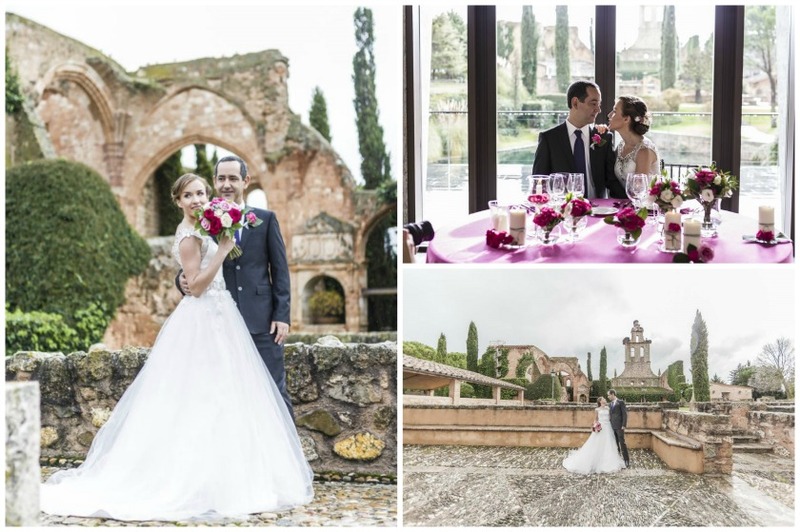 We are dedicating this article to show you their fabulous day – too beautiful to miss! 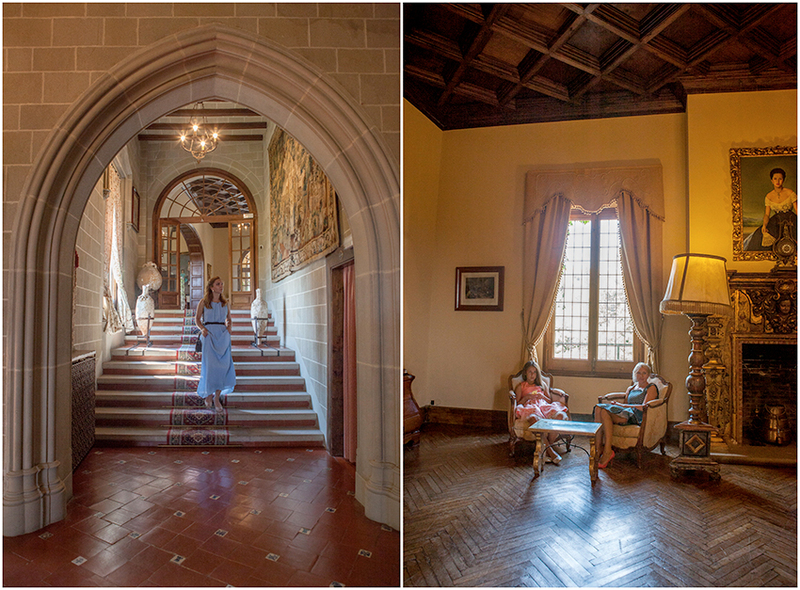 This castle has a very rich history – it served as a hospital during the Civil War in the 30s. It has both a breathtaking exterior and interior: its architect was a student of Gaudi! 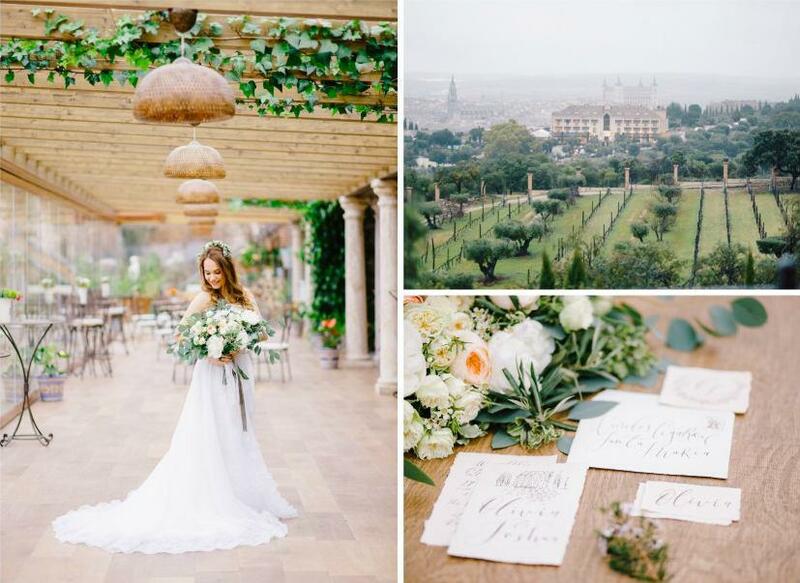 The stone walls are draped in lush greenery which make it even more pretty. The interior is just as spectacular. 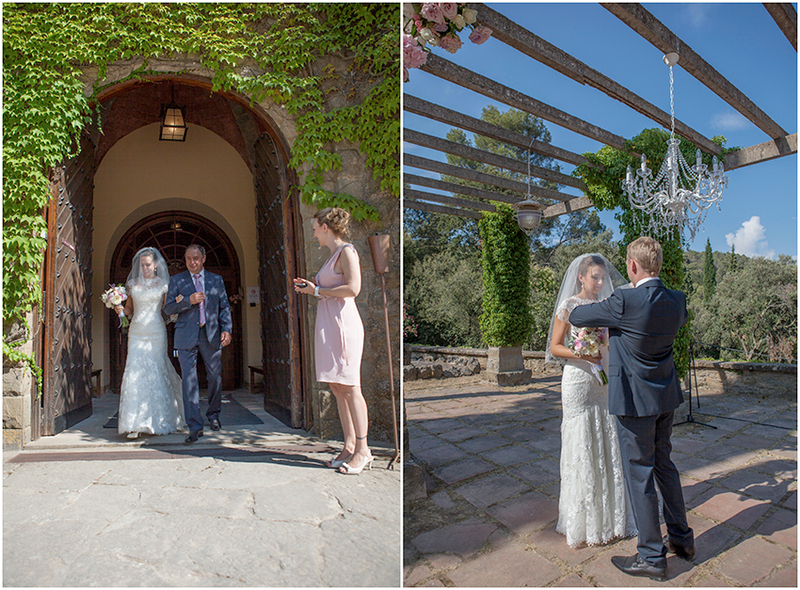 Full of magnificent portraits, exposed stone walls, big windows to let in lots of light and plenty of space to party! 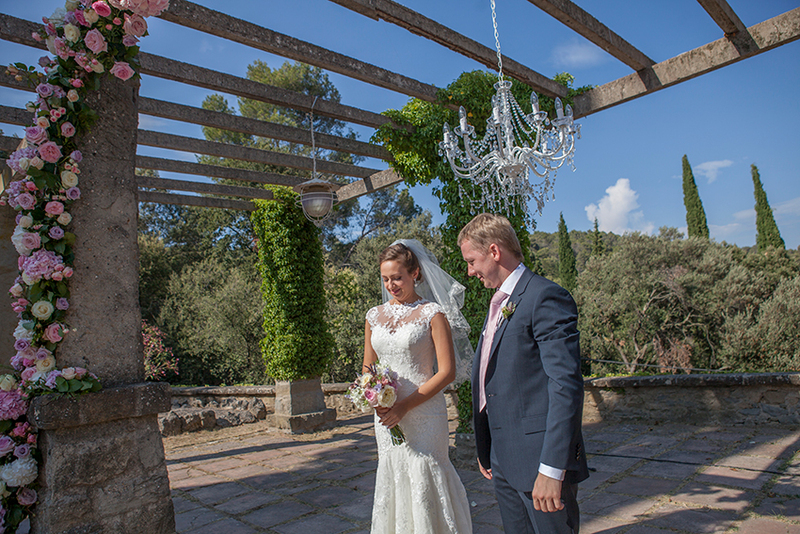 Denis and Olga had their ceremony outdoors under the spectacular Spanish sun. 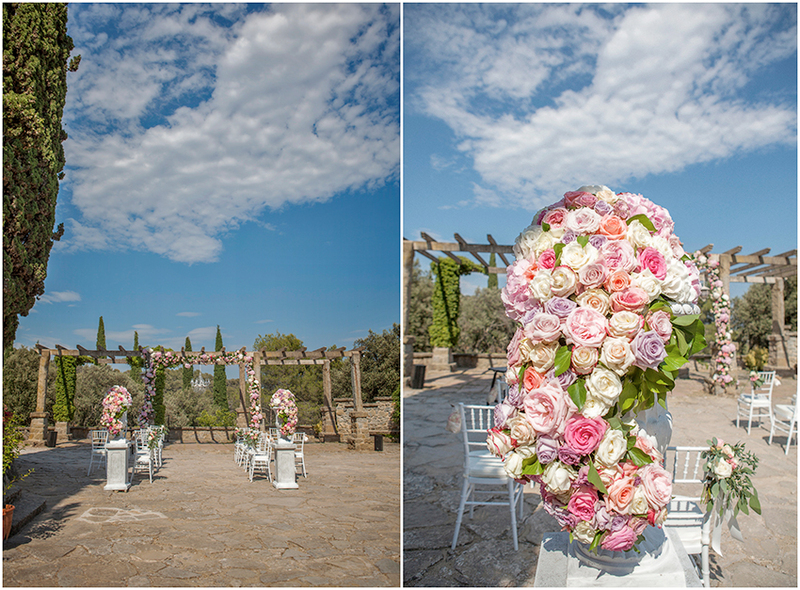 The area was decorated with stunning flowers in tones of pink, purple, white, yellow and peach. 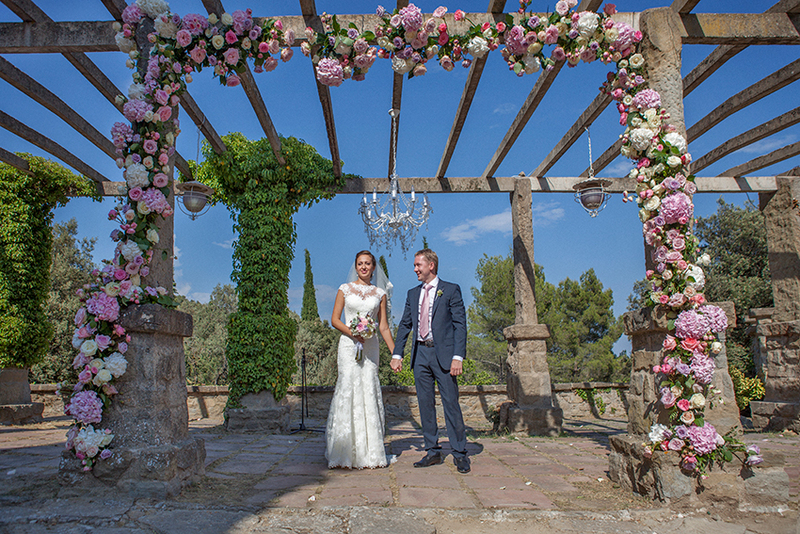 There was an archway decorated in flowers of the same style under which the couple were married. After the ceremony, the guests enjoyed a cocktail reception with delicious canapés and aperitifs followed later by a fabulous banquet! 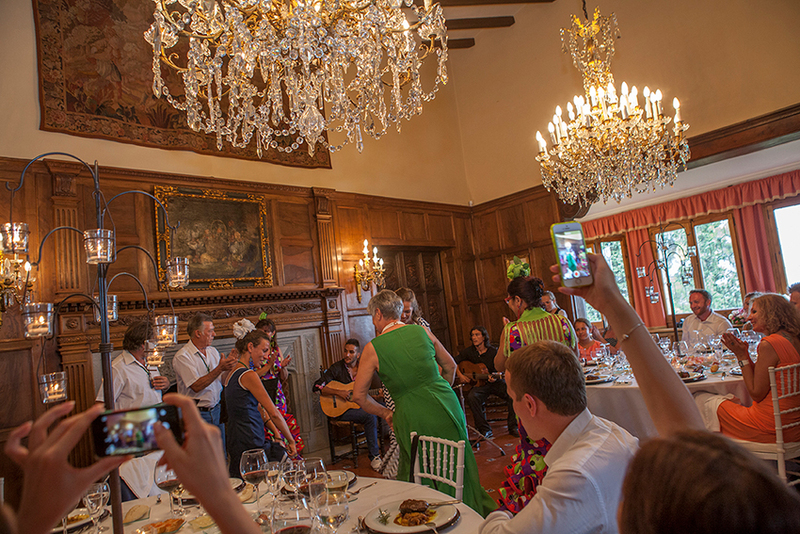 Everyone sat on large round tables inside the castle and there was even entertainment, with a guitars and dancing during this part of the wedding – so much fun! Finally, part of the reception and party was held outdoors, with lots of dancing and smiles. Both bride and groom were styled beautifully. Olga opted for 2 dresses, and a third for some photos on the beach, each one different but all equally lovely. For the ceremony, Olga wore a long, fitted white dress with lace detailing around the neck and shoulders. Her hair was up and she wore a veil with lace detailing at the end to match her dress and white pointed-toe shoes. The dress she wore for the reception was strapless and shorter, with a lace bodice and some rhinestones delicately sewn in. Finally, her third dress was more fitting for the beach on which her photos were taken. It was white and light with thin straps and a v neckline decorated with lace. She looked stunning in each one! As for Denis, he wore a dark grey suit and white shirt, accompanied by a black belt and shoes. In addition, he had a pale pink tie to match the tones of the flowers. He also changed for the beach photographs. 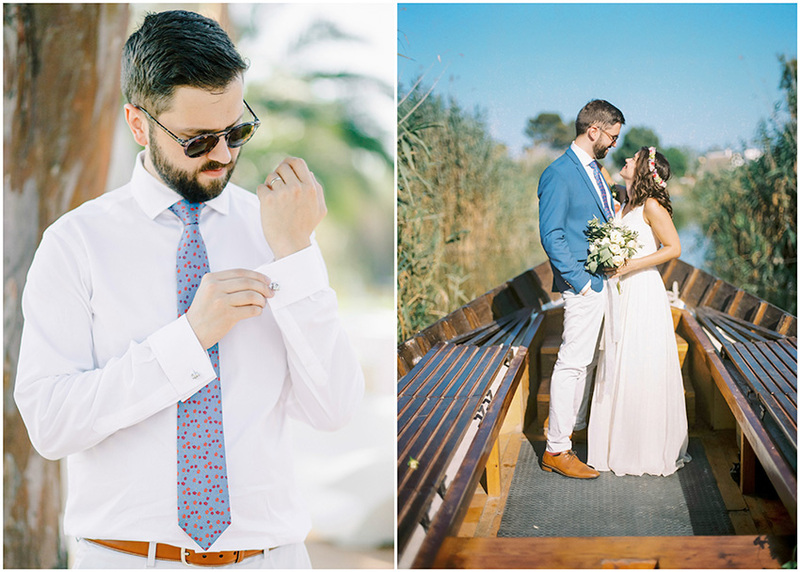 He wore a plain white shirt with the first couple of buttons undone and light beige trousers – a perfect beachy outfit for a groom! The wedding was perfect, just as Olga and Denis had dreamed. 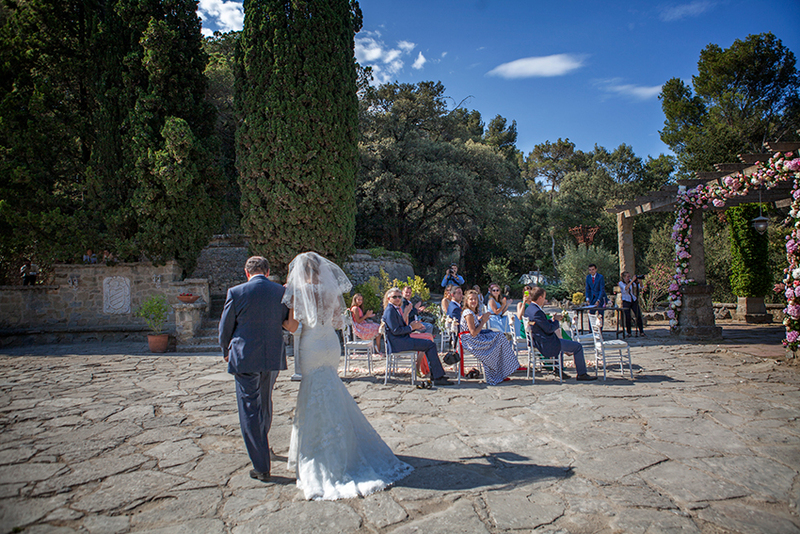 The stunning setting of this Spanish castle, coupled with the style of the bride and groom and the fun which the guests had made for an unforgettable day and created many happy moments for them all! 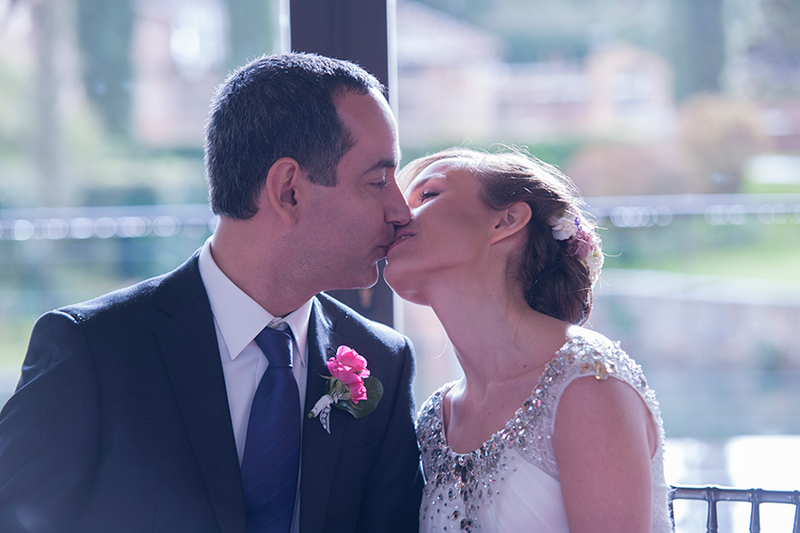 To see more examples of weddings we have organised, you can click here to see our portfolio. 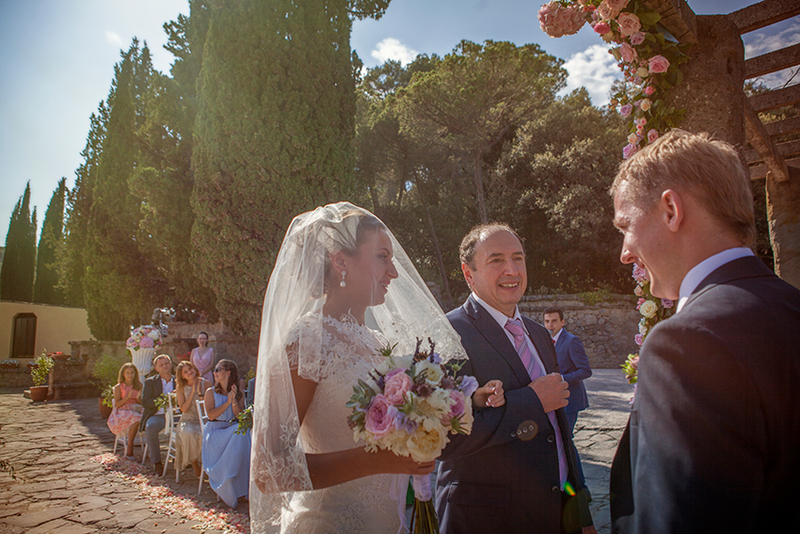 If you want to team up with us to help you create your perfect day, you can write to us at info@svadbavispanii.ru.